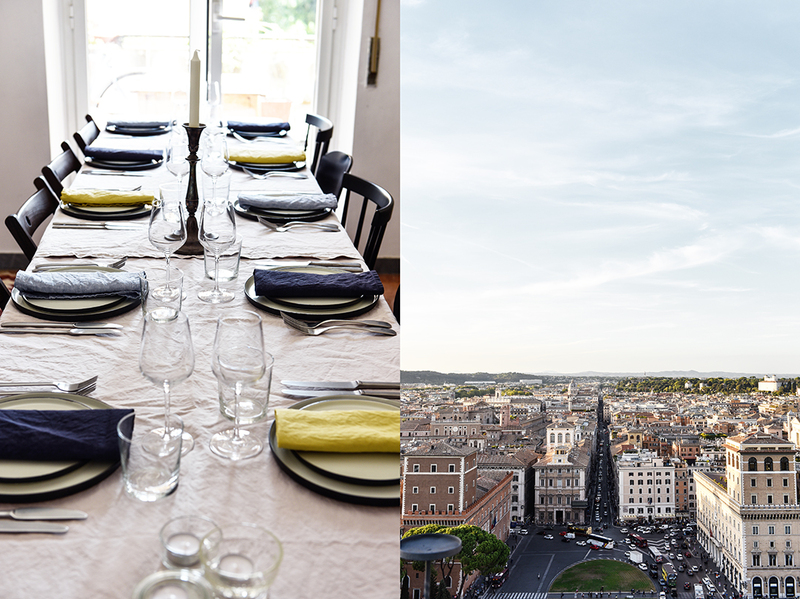 Imagine your friends throw an opulent dinner party in the pulsing heart of Rome on a Saturday night und you take over their kitchen hours before the guests arrive with a film team of four to peek over your hosts’ shoulders into their pots and pans. Sofie Wochner and Domenico Cortese dealt with our little invasion with remarkable patience. 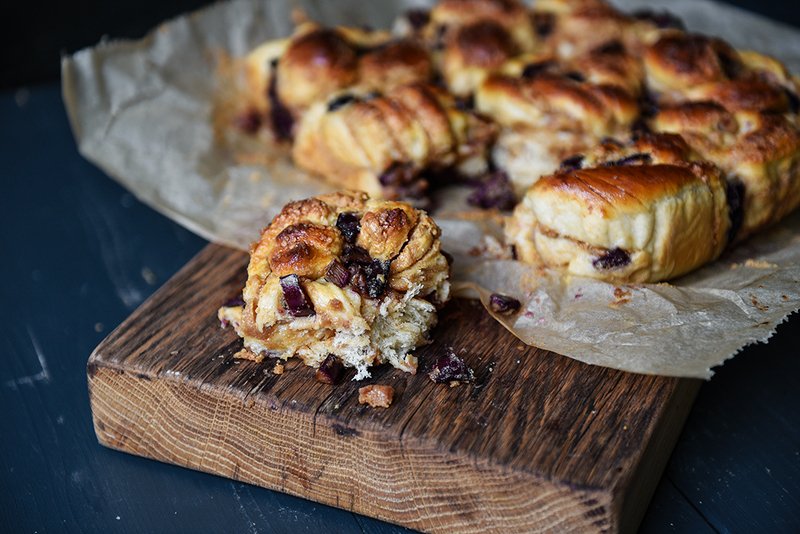 They even welcomed us with big smiles on their faces and a plate full of fresh buttery Danish cinnamon buns in their hands. 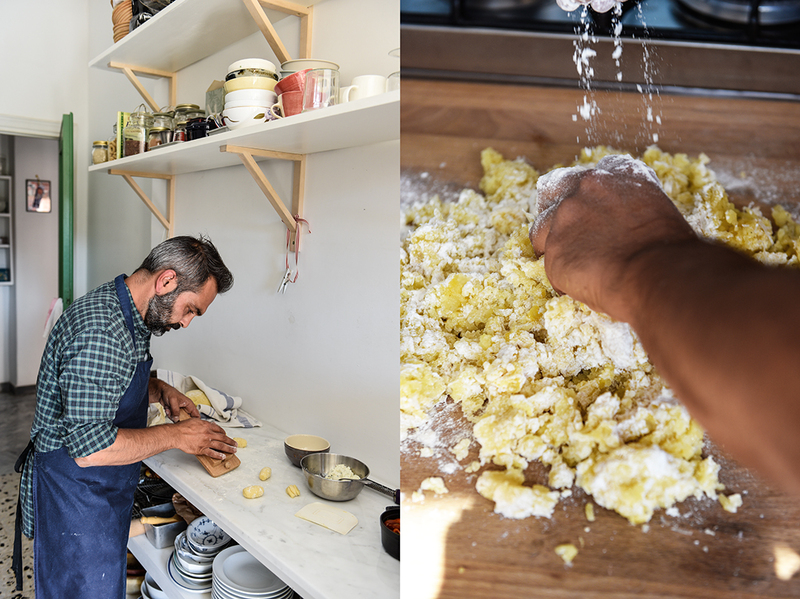 The passionate couple is a confident team in the kitchen, they complement each other and combine two worlds that are geographically and culturally far apart, but somehow match smoothly. 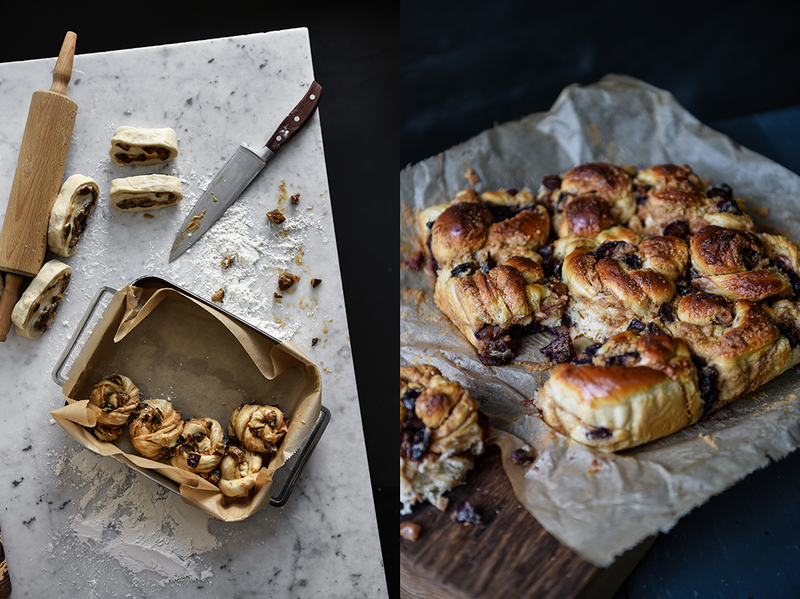 Sofie is a Danish baker and pastry chef with the impulsive temper of an Italian Signorina, self-taught Chef Domenico comes from Calabria, from the southern tip of Italy, but totally lacks the Mediterranean drama that one would expect. His voice is calm and his movements are concentrated, he’s quiet and focused when he works in the kitchen. 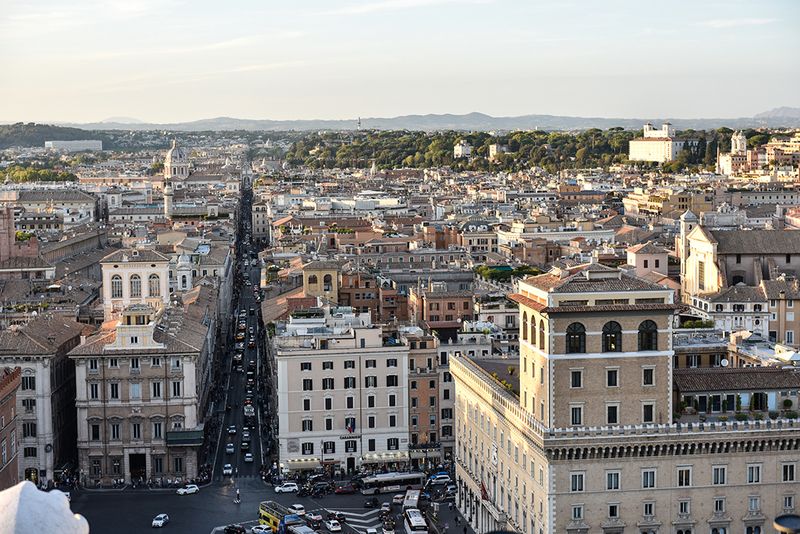 He says he was born in the wrong country, he feels much closer to the northern European mentality, whereas his woman only feels as free and inspired as she wants to be when she’s in her adopted city, in Rome. A city kitchen is often a space of improvisation and elaborate compromises, the smallest but also the most charming room of an apartment. It’s the place where everybody meets at a party, making use of every square inch, squeezed and snuggled in, the happy crowd talks, eats, and drinks until dawn. 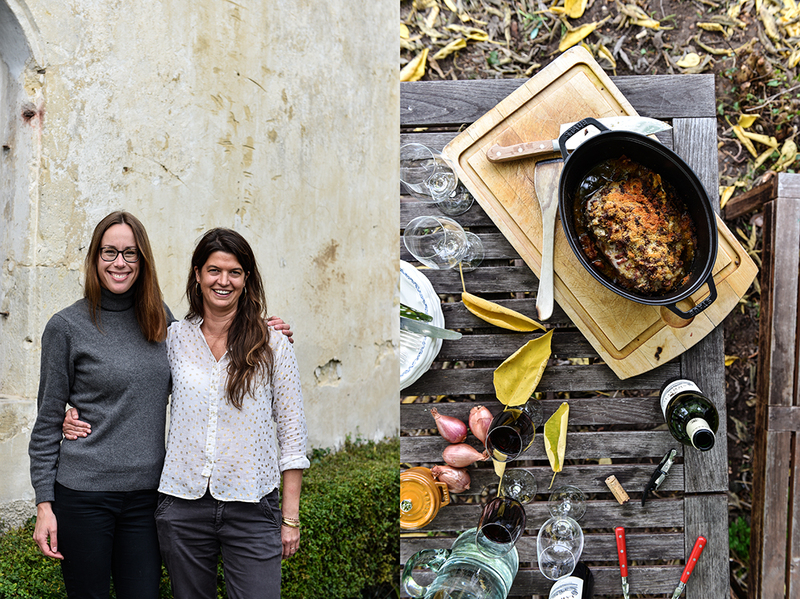 Our hosts’ kitchen is just such a magical place, but it’s also a room where the two chefs manage to create the most wonderful dishes for private gatherings, catering, and highly anticipated supper clubs. 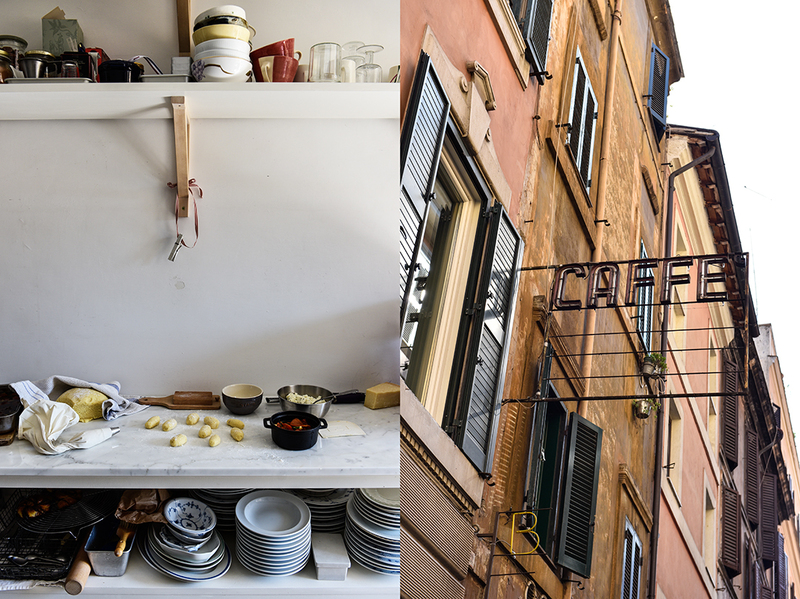 When it’s time to open the doors for their Eatery In Rome pop-up restaurant in their flat’s dining room, the kitchen turns into a busy laboratory functioning like clockwork. 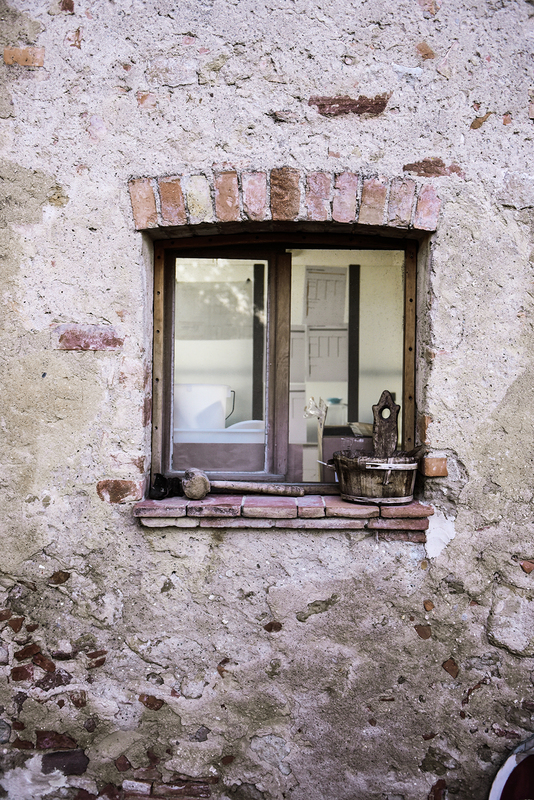 Loaves of bread and cakes baking in batches in the single oven, pillowy gnocchi rolled and shaped on the wooden board at the window, and bell peppers roasting in the flames of the old gas cooker. 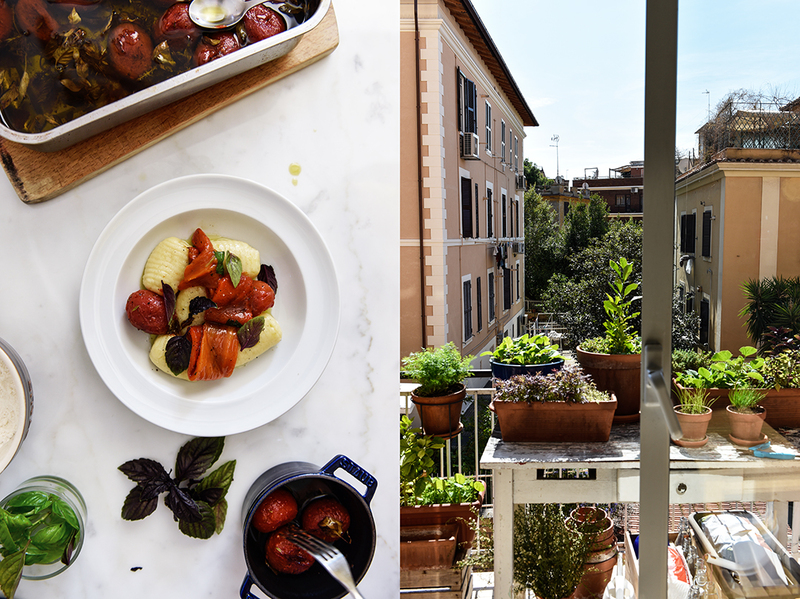 The room is bright, facing the pretty balcony, Domenico’s beautiful little herb garden where basil, thyme, and rosemary grow happily under Rome’s ever shining sun – all waiting to be used in the masters’ glorious recipes, like their Stuffed Gnocchi with Mozzarella di Bufala, Confit Tomatoes and Flame-roasted Bell Peppers (you can find the recipe below). The potato gnocchi melt in your mouth like fluffy clouds, the creamy filling makes it smooth and fits perfectly to the candy-like tomatoes and smoky peppers. 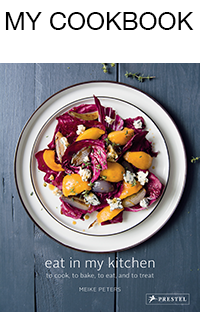 It’s a delicious stunner, a colorful homage to the beauty of Italian cuisine. In the past few months, the busy duo made their dream come true and started working on their new baby: Marigold. 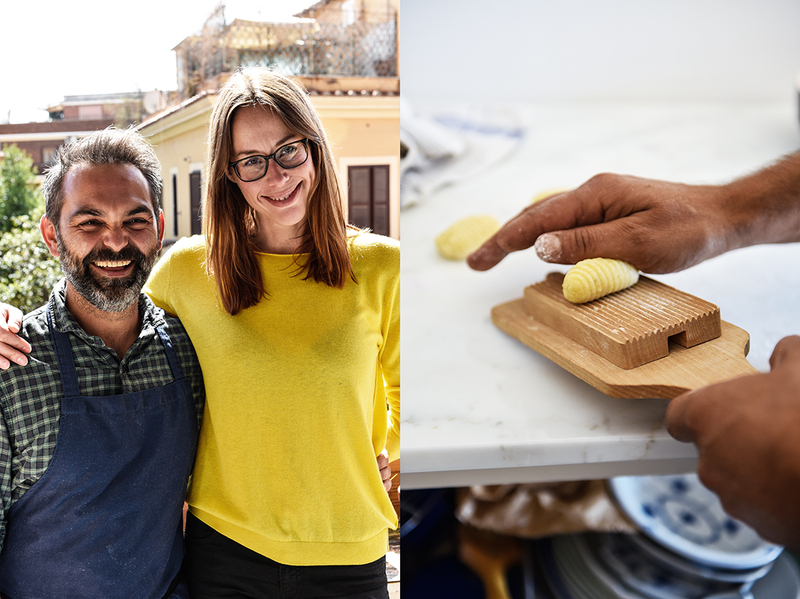 If you would like to support Sofie and Domenico and help them funding their new restaurant and micro bakery in the Roman neighborhood Ostiense, click here. Many new Meet In Your Kitchen features took me to California, Japan, France, and Italy in the last few months. Thanks to Zwilling for sponsoring these features for our culinary trip around the world! Thank you, my man James Hickey, for joining me on these adventures and helping me take pictures! Prepare the confit tomatoes and roasted bell pepper a day in advance. 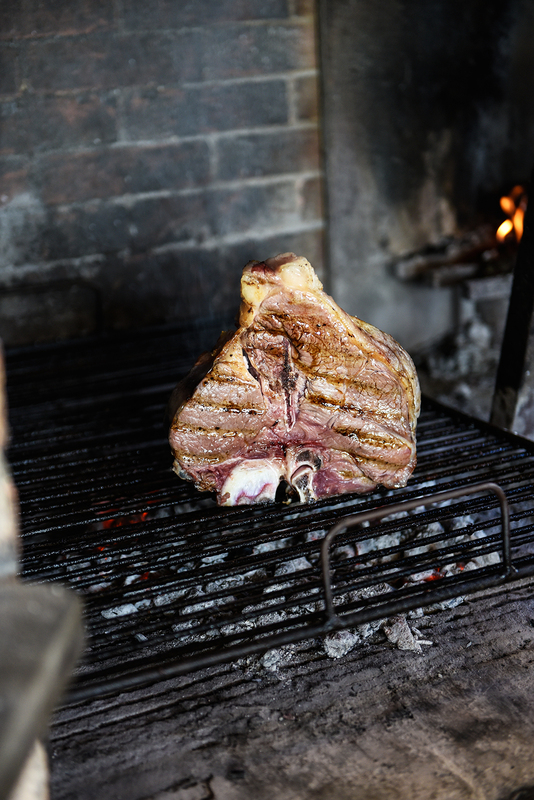 You can either grill peppers in the flames of a gas cooker (that’s what Domenico does) or grill or roast them in the oven (on the highest temperature, turning them every few minutes until partly black), which is the safer method. Place the pepper on the gas flame of your cooker set on medium heat. Turn the pepper every now and then, mind that the skin turns dark and forms blisters evenly on all sides. Transfer the hot pepper to a bowl and cover with cling film, let it sit for 15 minutes. Use a small, sharp knife to peel the pepper, cut it in half, and scrape out and discard any seeds and fibers. Cut into strips and transfer to a bowl. Add the garlic, parsley, salt, and pepper and cover with the olive oil. Cover the bowl and let it sit for at least a few hours, or over night. Bring a medium pot of water to a boil. Fill a large bowl with ice water. Clean and score the skin of the tomatoes. Blanch them for 20 seconds in the boiling water, then transfer to the ice water. Use a small, sharp knife to gently pull off the skin without cutting them. Transfer to a small baking dish, season with salt and pepper, and cover with cling film. Let them rest in the fridge overnight. Take the tomatoes out of the fridge about 1 hour before roasting them. Preheat the oven to 130°C / 275°F. Spread the herbs and garlic on top of the tomatoes and cover them completely with olive oil. Roast for about 4 hours or until they are soft. For the filling, purée the mozzarella, Parmesan, basil, olive oil, salt, and pepper in a food processor or blender until smooth. Season to taste with salt and pepper and chill in the fridge for 10 minutes. For the gnocchi, boil the potatoes in unsalted water for about 30-40 minutes or until soft. Drain and let them rest for 10 minutes. Peel the potatoes and press them through a potato ricer onto a large chopping board or kitchen counter, form a little dome. Add the egg, Parmesan, salt, pepper, and nutmeg and, using your hands and a dough scraper, mix everything together. Add the flour in batches and mix quickly until the gnocchi mixture is combined. Add more flour, if it’s too sticky; mind not to over mix it. 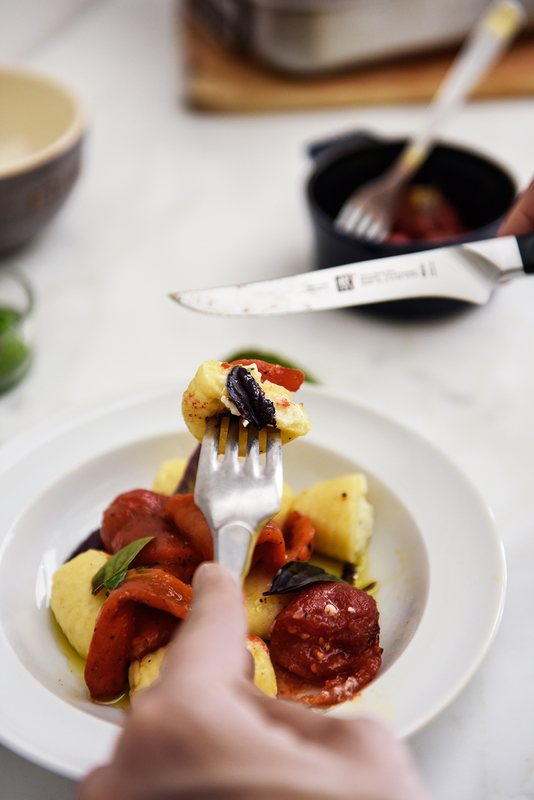 Form the gnocchi while the mixture is still warm: Cut off a handful of dough, keep the remaining dough covered with a tea towel, and roll it into a 2.5cm / 1 inch-thick roll. Cut into 1cm / 0.5 inch-thick slices. Using 2 fingers, make a dent in the middle of each slice. 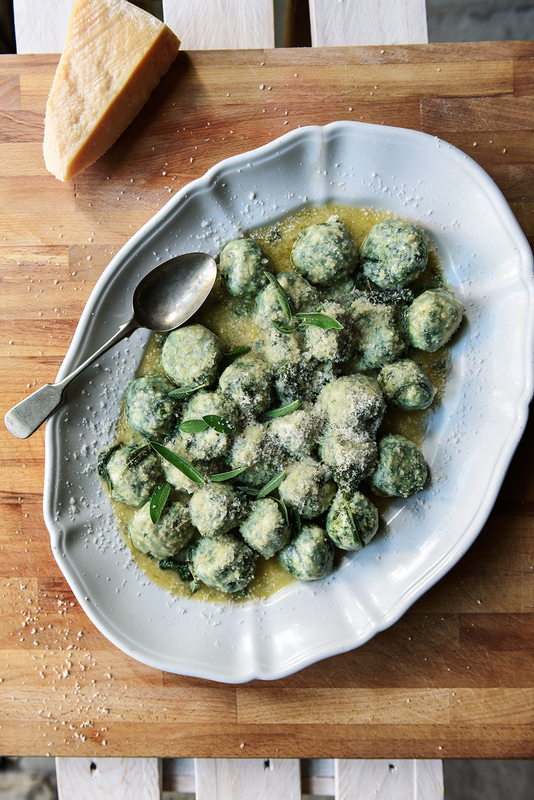 Add a tablespoon of the filling and close the gnocchi by rolling it in your hands. 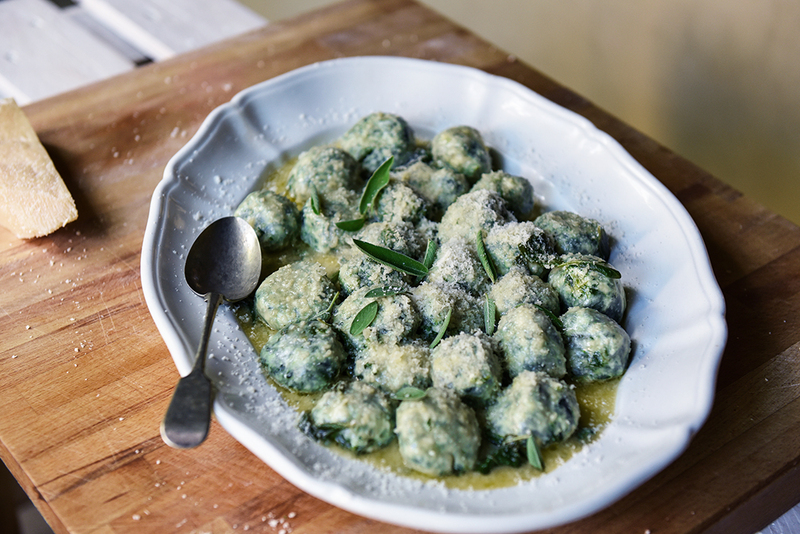 Transfer the gnocchi to a baking sheet dusted with flour. 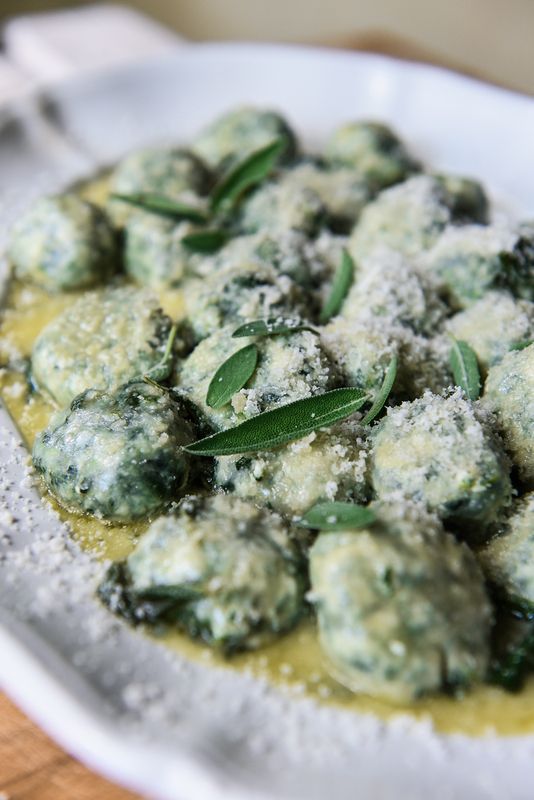 When all the gnocchi are filled, cook them immediately in salted water (it should taste like the sea) for about 3-4 minutes or until they raise to the surface; or freeze them, but don’t keep them in the fridge. 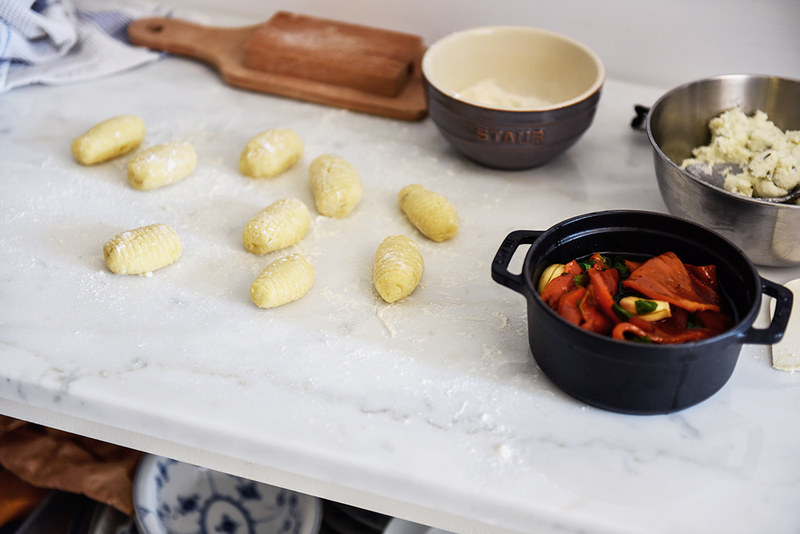 Using a slotted ladle, transfer the gnocchi to the plates. 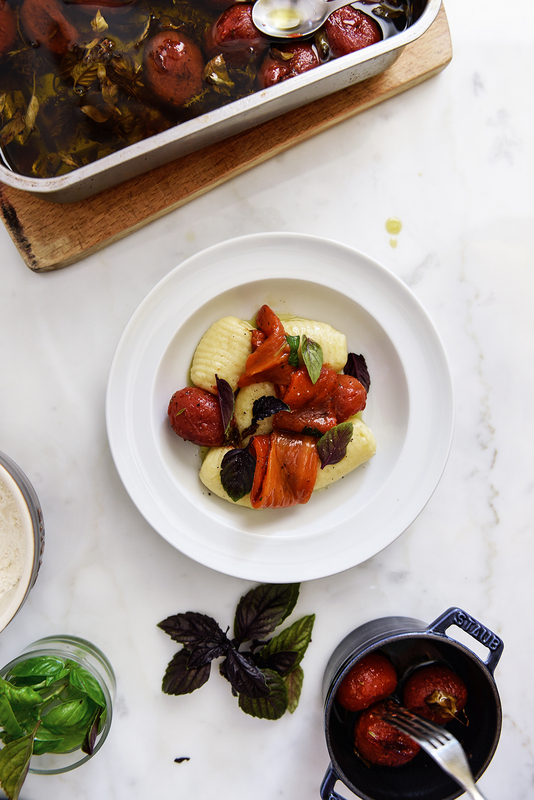 Arrange the confit tomatoes and roasted peppers on top, drizzle with the oil used to roast the tomatoes, and sprinkle with fresh basil. Sofie Yes, I’m Danish and I moved to Rome four years ago to live with Domenico. 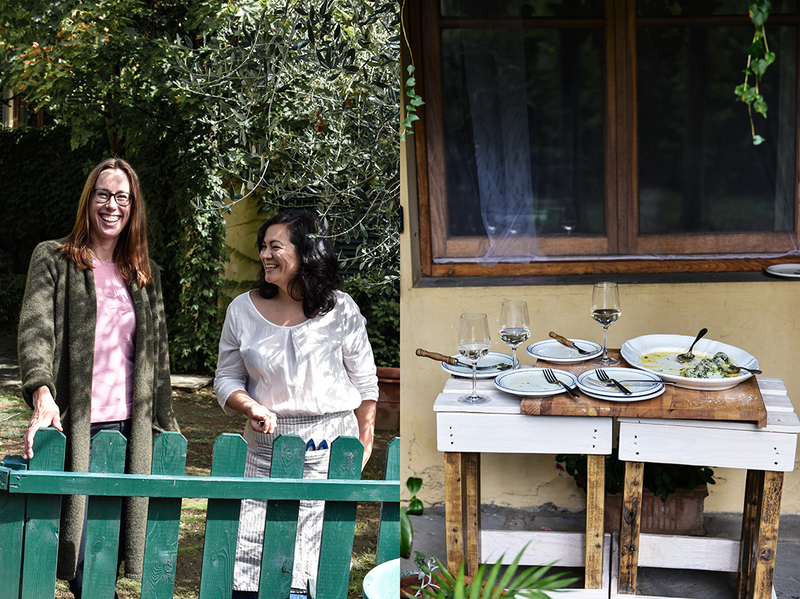 Straight away, we started our little pop up restaurant in our home here in Rome. I make the bread and the pastry. So we divide the work between the two of us. And you’re the chef, Domenico? Domenico Si! Our work is completely separate. I’m not so good with pastry because I don’t like to follow the recipe, but I like the freestyle more. Sofie You’re a creative soul. Domenico I’m a chef and I don’t know how to work with recipes. I need to be creative and use my inspiration – from my work at the American Academy as well as from my Italian background. Now I have arrived at a place in my life where I have really found my own style. When did you arrive here in Rome? Domenico It was in January 2000. Before that, I spent 5 years of my life in Holland and I then decided to come back to Rome – especially because part of my family is here. Domenico I’m originally from Tropea, a small town in Calabria, where I grew up until I was 18. Sofie, what made you leave Denmark? Sofie I’ve always been extremely adventurous and I always felt that maybe Denmark, or maybe Copenhagen, was a little bit too small. That the mentality is – without sounding arrogant – but it’s a bit closed and I’m kind of a loud person (laughing)! So I felt coming to Italy, I kind of came home in a way. Here, there is space to be who you are. You don’t need to fit into a little box. But I still love Denmark and Copenhagen and where I grew up. 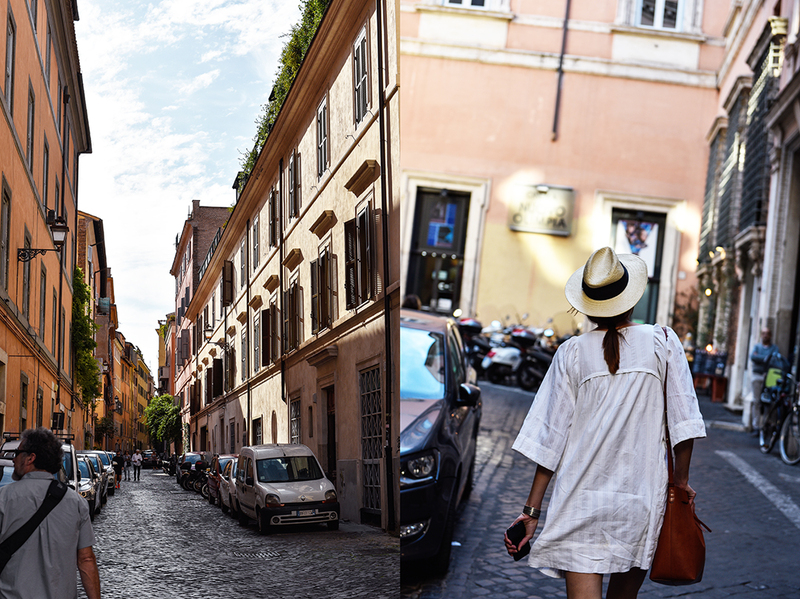 I go back quite often but I really feel at home in Rome. 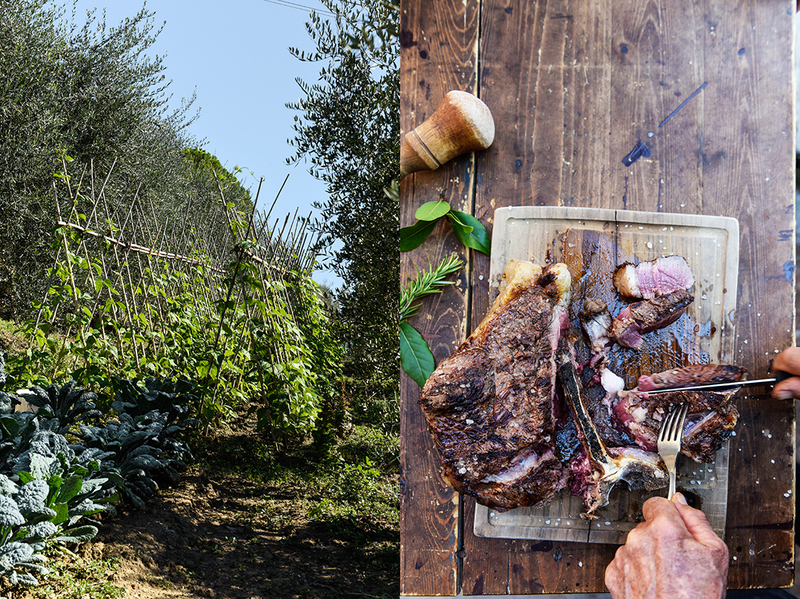 How do you bring your two worlds together, the Danish and the Italian mentality? Sofie In many ways I’m more Italian than Domenico is. And he’s more Danish than I am in the sense that Domenico is very precise and he’s always on time. Yes, you’re quite organized and structured. Domenico Honestly, maybe too much sometimes! Sofie …being from two different cultures. A relationship is always hard work but in many ways we also find a way to balance it out by being attracted by each other’s cultures. Domenico could easily live in Denmark if that happened one day but I prefer to live here! 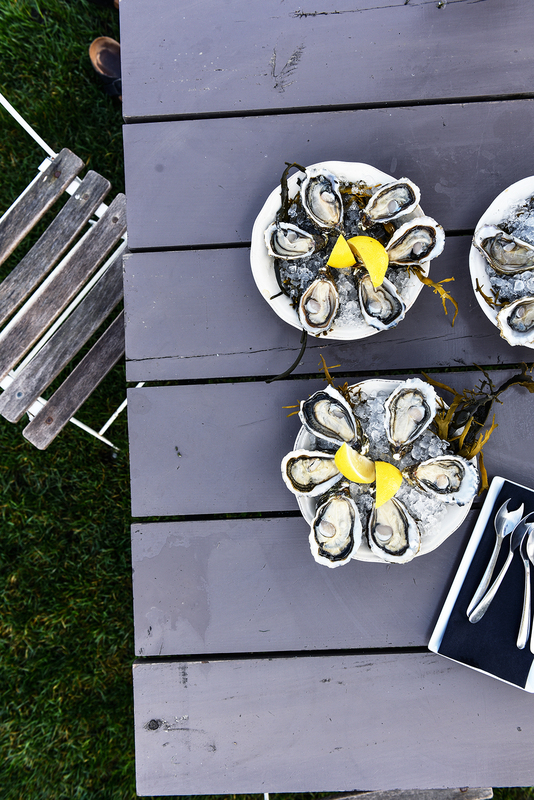 Can you tell us a little bit about your supper clubs? Sofie Yes, it started 3 1/2 years ago now. It came a little bit by coincidence. We both had this dream about opening a restaurant. And you don’t do that overnight. So we thought maybe we could just start at home. How many tables can we fit into the living room? Domenico Yes, let’s try and see how it will work. Which kind of guests can we get? Domenico … to show to our guests what we can do. Domenico …the basis is the Italian cuisine but of course we kind of try to change a little bit or invent something new. Sofie It’s a feast! In our pop-up restaurant at home we have 12 people sitting at a long table, so you’re eating with people you don’t know but who you get to know very quickly. It’s one big dinner party with people you don’t know which is very unusual here. And every dinner and every evening is completely different to the others, but there’s always a good energy. Domenico Yes, I can hear it from the kitchen! Domenico …and laughing! It’s nice! Did you ever have a funny experience? Sofie We had a very, very romantic experience! 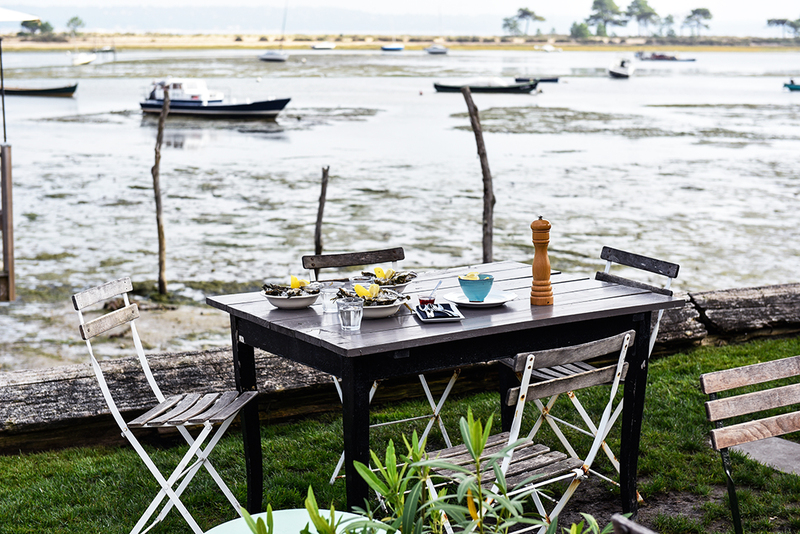 We had two guests, they both came here before, and then one evening, they were here at the same time – they didn’t know each other – and they started to chat over the table. So they met and they got together and then they came back with their parents and they’re in a serious relationship. And they keep coming back! I think they’ve been here like four times! So they kind of grew with us. It was a really cute thing and they are such lovely people. And then one day they will bring their children! 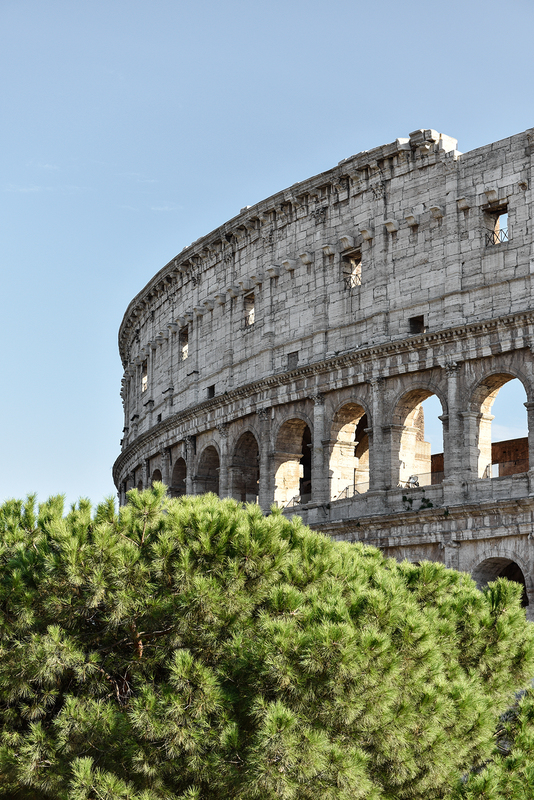 Do you think that the people who come to Rome, the tourists, have a very clear idea of what they expect to eat when they come to this city? Sofie Yes. I think it’s fair enough because you come to the most ancient city in the world, so of course it’s not vibrant, modern, things are not changing every half year with a new trend. Of course you know what you’re getting. 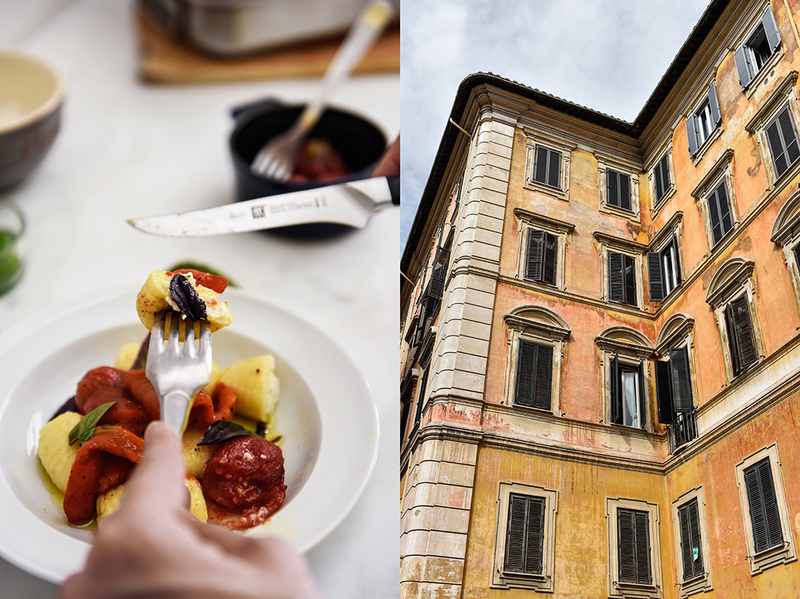 Unfortunately, because there are so many tourists passing through Rome the quality of even these key dishes in the city is just not good enough. They don’t respect people enough here, and they’re not being proud enough about what they do. I think that’s disturbs us sometimes. Who doesn’t love a creamy cacio e pepe? Or a carbonara? But you don’t need to put cream in there! There shouldn’t be cream in there. They don’t expect that the people coming here to visit can actually taste what they eat. That’s a bit of a shame because Rome also doesn’t have the best reputation. In Paris, there has been this small revolution and I think slowly I can see it happening here too. The younger generations are observing that there is something to be done here, that we’re losing something if we don’t respect our traditions more. Even though the traditions are very strong, it’s not expressed in the actual plate in front of you. Domenico, what is your greatest kitchen hack? Domenico For the gnocchi, you need to have really good, starchy potatoes. 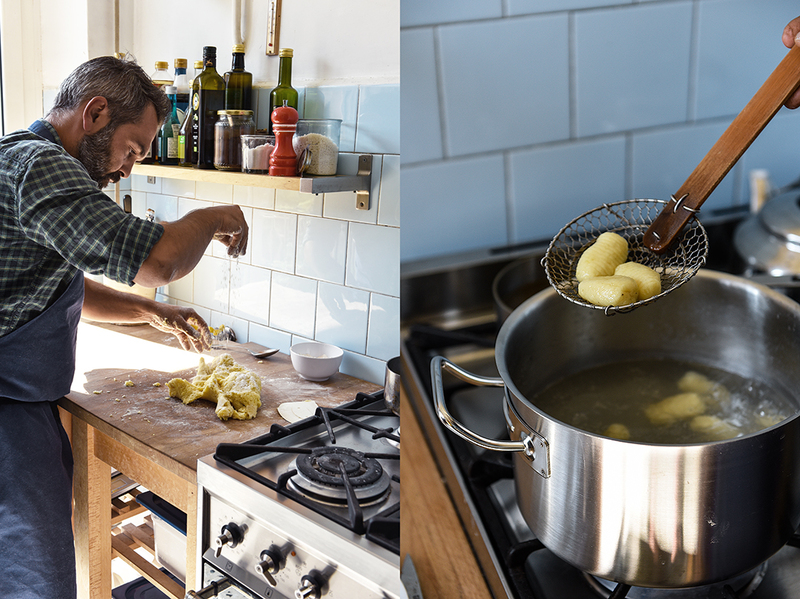 You can choose between two kinds of potatoes, but the trick to make really good gnocchi is to have starchy potatoes! Sofie Being a Dane, I have to mention Danish butter because I actually use Danish butter here. Italian butter doesn’t have the right structure. It’s really important when you do pastry that you use the right kind of butter. It doesn’t necessarily need to be organic either. Often, organic butter tends to hold too much water which means your pastry or your cake can become wet in a way – it doesn’t get the right structure. I can only use French butter or Danish butter in my pastry. So, I believe the basic key is to use really, really good butter. And lots of it (laughing)! Domenico My mom. I have a lot of memories as a child, but I remember I really liked the minestrone. She used to strain everything but it was so good. Sofie I’m very, very fond of the way Chad Robertson from Tartine Bakery in San Francisco bakes his bread. I even went there to see them bake. 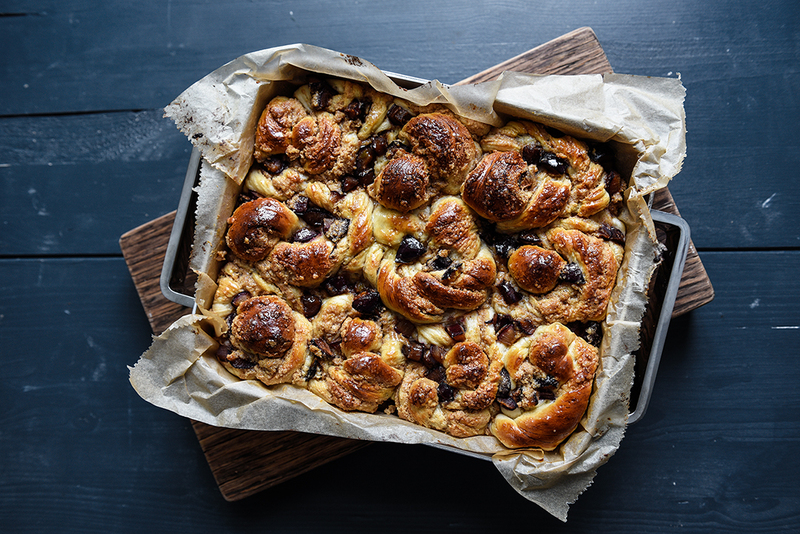 But for him to bake a loaf of bread for me, take it out of the oven and serve it to me with Danish butter (laughing), I think I would be in heaven! Mille grazie, Sofie and Domenico! The light was warm and golden as we drove down the rocky alley to Podere Il Casale. It was late in the afternoon, later than expected, but that’s what happens when you enjoy Tuscany. 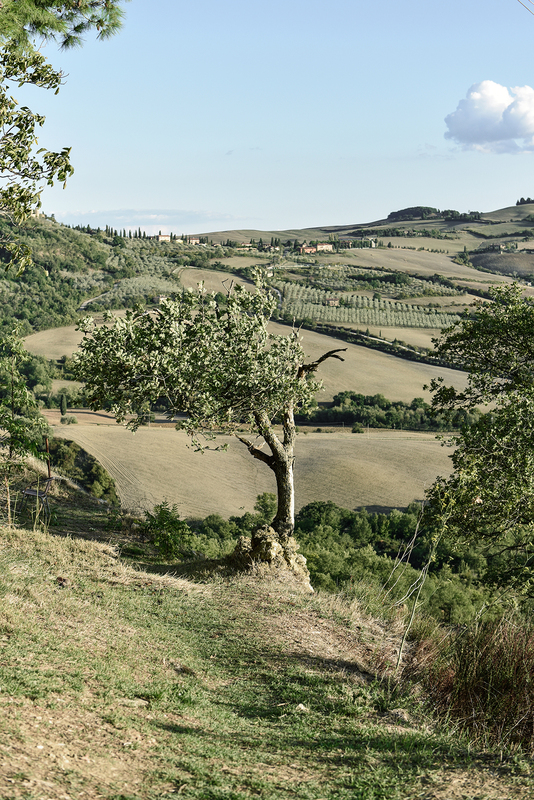 The sun was so low that it almost touched the Tuscan hills that seem to embrace the secluded farm tucked in between Pienza and Montepulciano. 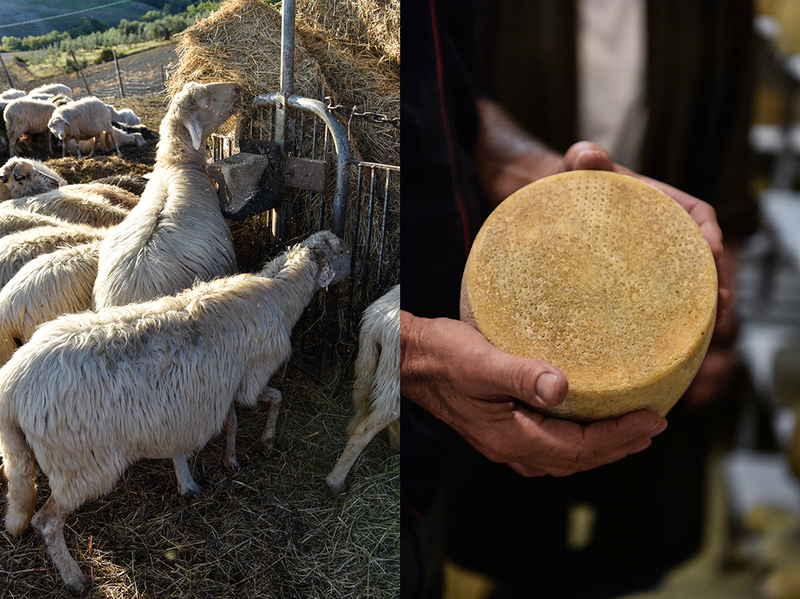 I came to visit the celebrated Swiss cheese maker Ulisse Braendli, to see his sheep and goat herds, and try his Pecorino, but I found so much more. 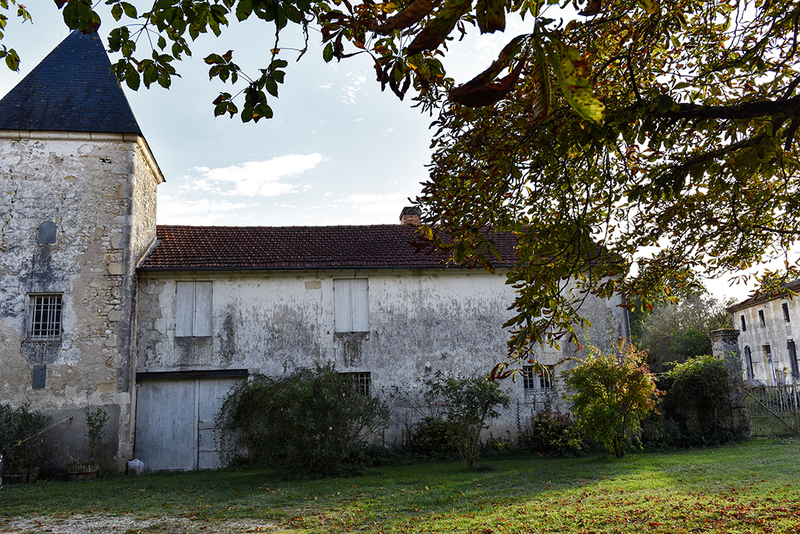 There is a silent peace laying over this farm like a blanket, it calms your mind as soon as you walk past the old terracotta-colored farmhouse. As you stand on the terrace, a breathtaking viewing platform, under fragrant pine trees protecting you like an umbrella, as you see the landscape laid out majestically in front of your eyes, soaked in dimmed shades of green and ocher, you can only smile and thank life for such unbelievable beauty. 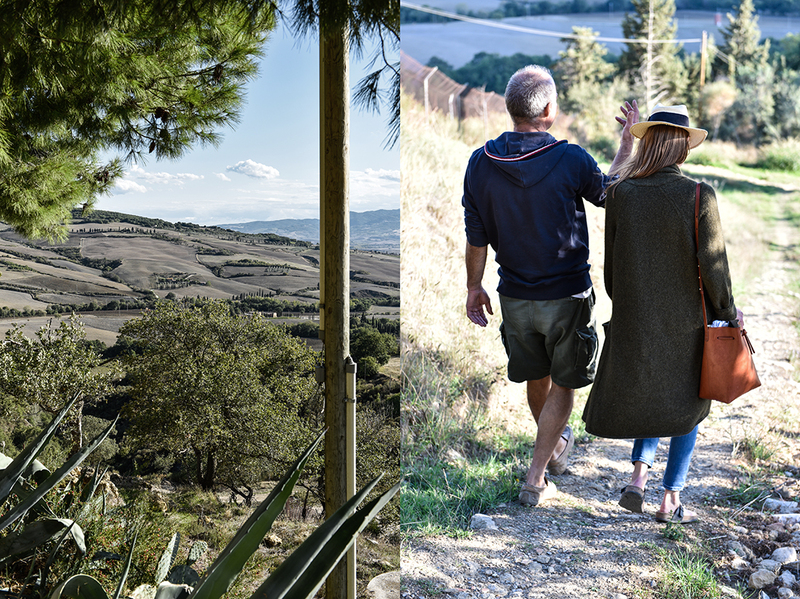 All the people and places I visited in Tuscany for my culinary trip around the world together with Zwilling had one thing in common, they all give themselves into the hands of nature with great trust and respect. No matter what obstacles they have to fight, what problems they have to solve, they know that nature gives and takes and that there’s a balance. 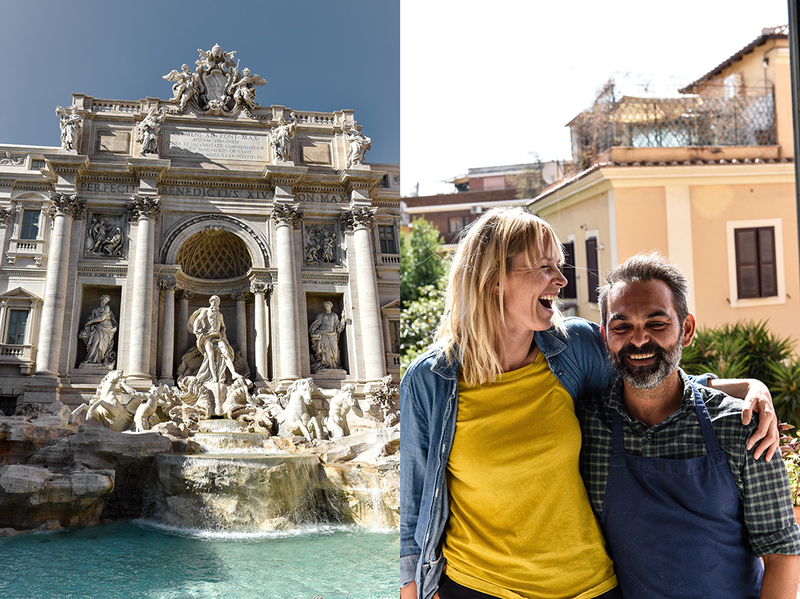 It’s not an easy life, but that’s also not what Ulisse was looking for when he and his partner Sandra left their home country and started a new adventure in Italy almost 30 years ago. Life is tough on this piece of land that they bought, but it’s also incredibly rewarding. 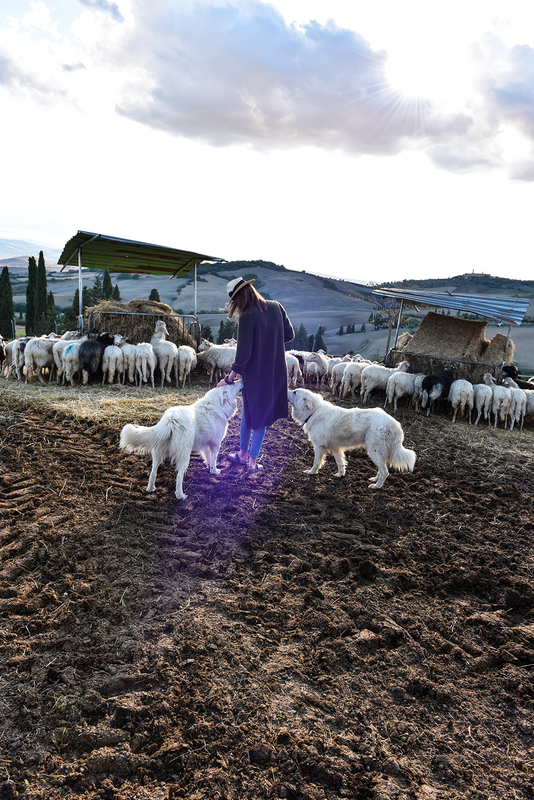 They started with 3 sheep and now there are 200 of them, living an enviably good life under the Tuscan sky. 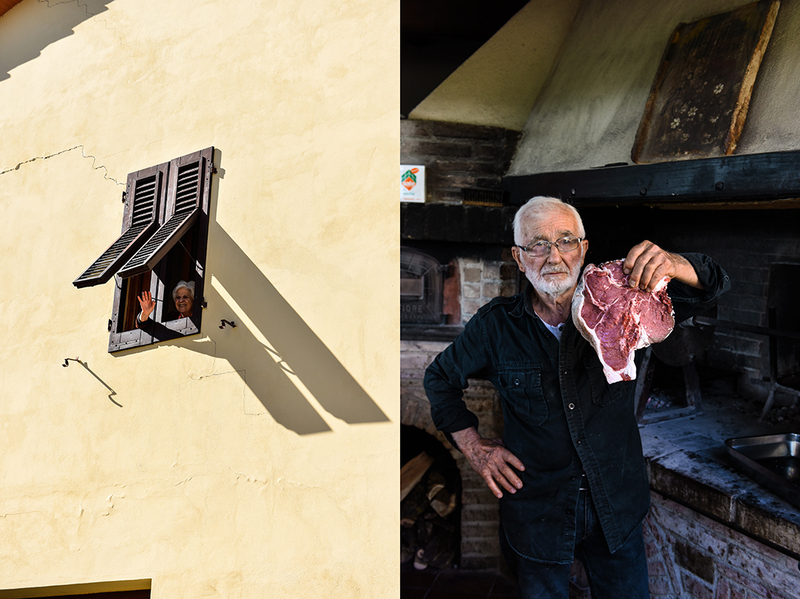 Ulisse loves Tuscany for being real, traditional, and romantically old-fashioned. 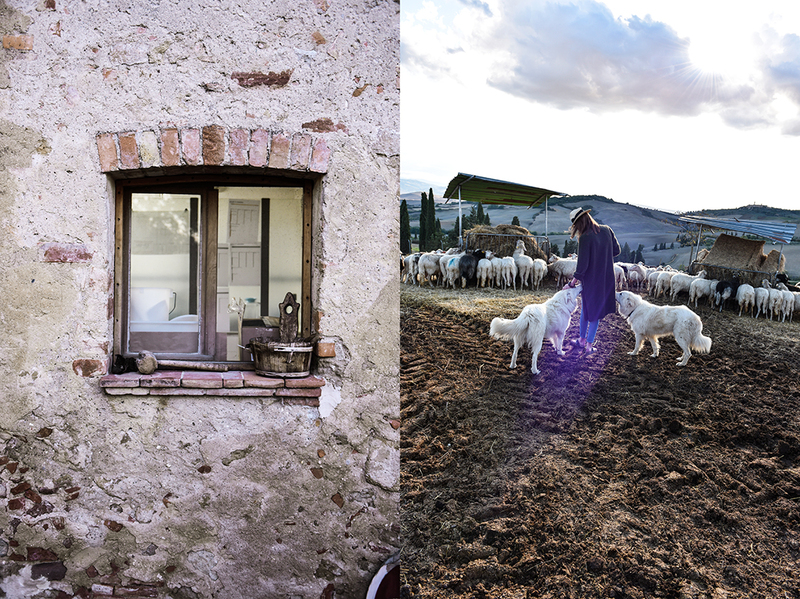 Electricity only came to Podere Il Casale in 1980, before, it was a very simple, basic life. 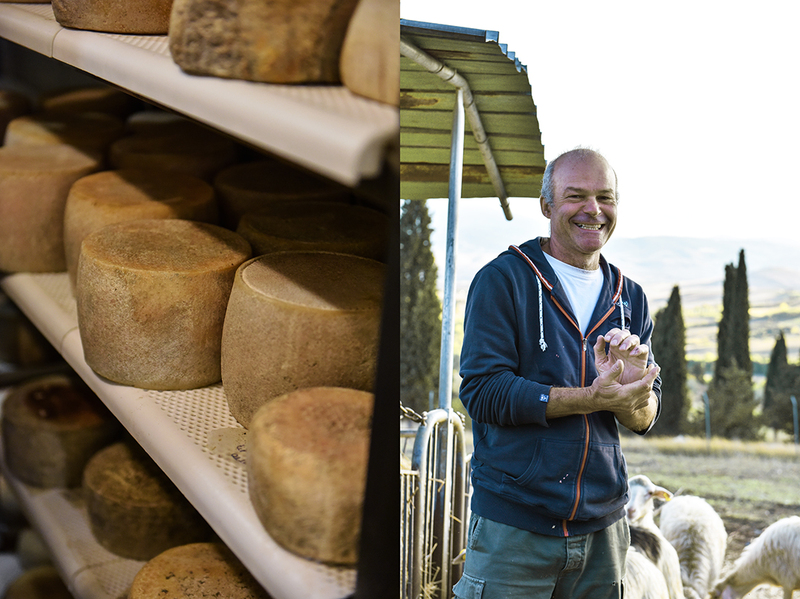 The farm is the perfect setting for his vision, to “help” nature create beautiful raw milk cheese. 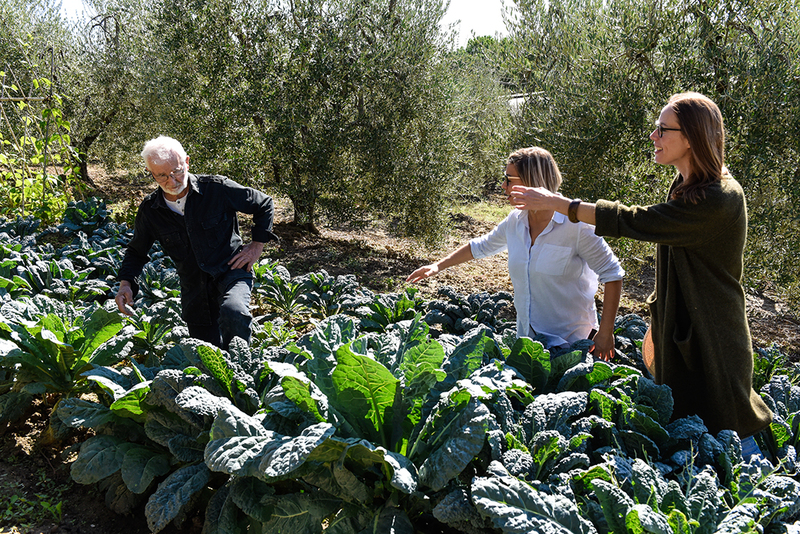 All the cheese, vegetables, and olive oil from the farm are organic, but that’s not an option, that’s the standard in his philosophy: “Conventional farming is strange, organic farming is normal. Wasting less of our food than the 40% that actually end up in the bin, is one of the solutions to open the doors for organic, local, and seasonal food for the broader population.” His mother planted the seed for his critically creative mind, she taught him to be open and experiment. “I blame the 60s,” says the cheese maker with a smile on his face. 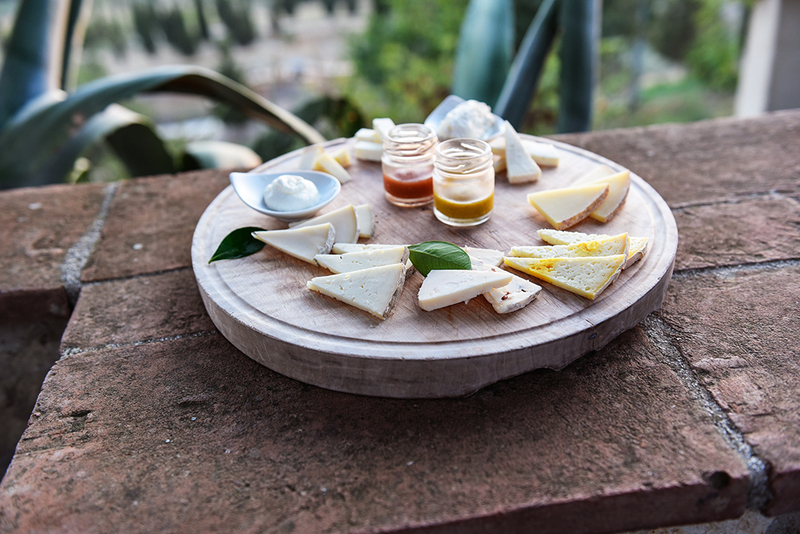 The cheese at Podere Il Casale is made with just three ingredients: raw milk, rennet, and salt. Every kind of milk is different, depending on the four seasons, the weather, the soil, and the food that the sheep find on the fields. 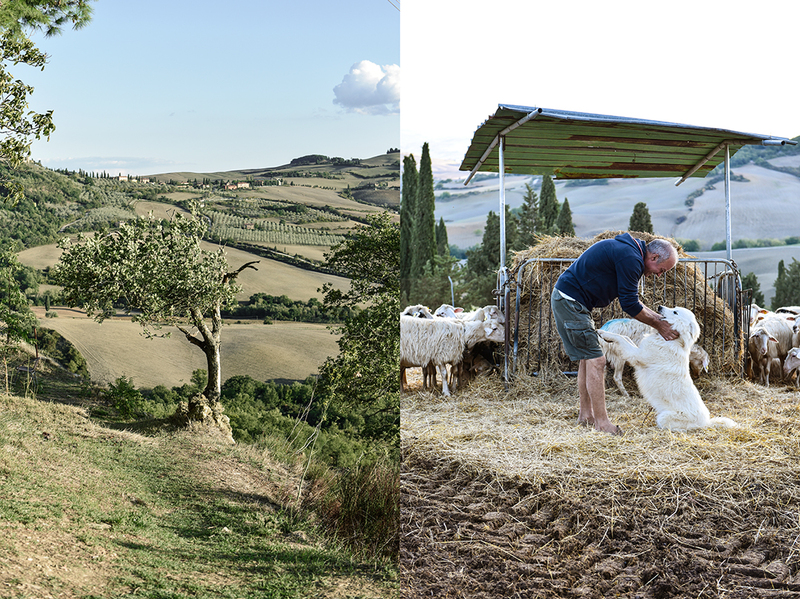 “Great food makes great milk and that makes great cheese – and every season makes a different cheese.” That’s the whole humble secret behind a Pecorino that so many people praise as one of Tuscany’s best. When the animals are outside, when they eat good food and there’s space, you have less problems with diseases, you don’t need chemicals, you can keep it under control with homeopathic methods. 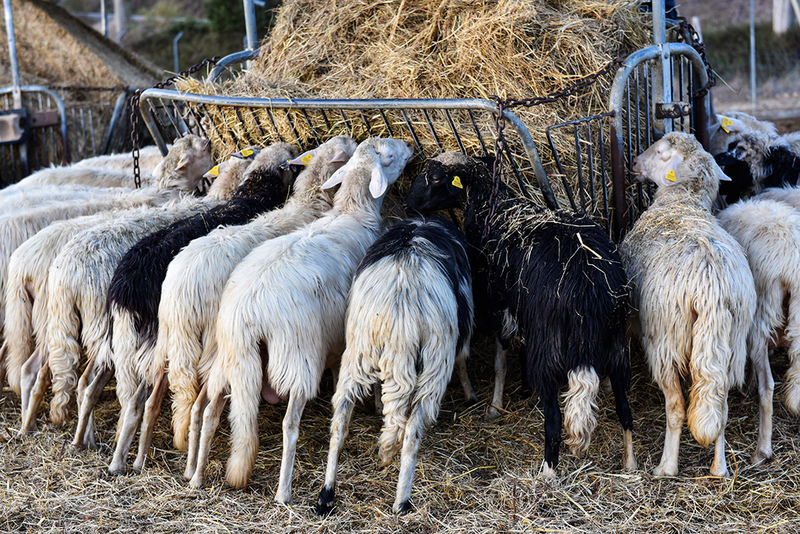 The animals eat barley, oats, and beans when they are in the barn, their “power food”, and hay and grass on the fields. Raw milk cheese has a strong connection to the place where it comes from, to the animals and the climate. 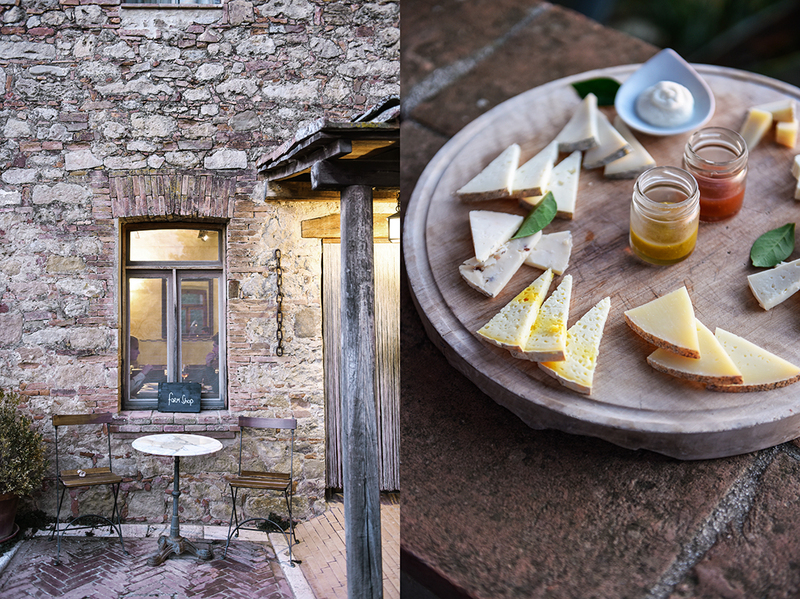 To taste Ulisse’s sheep and goat milk cheese, young and ripe, pure and refined with white truffle or saffron, was one of the purest pleasures during my trip in Italy. 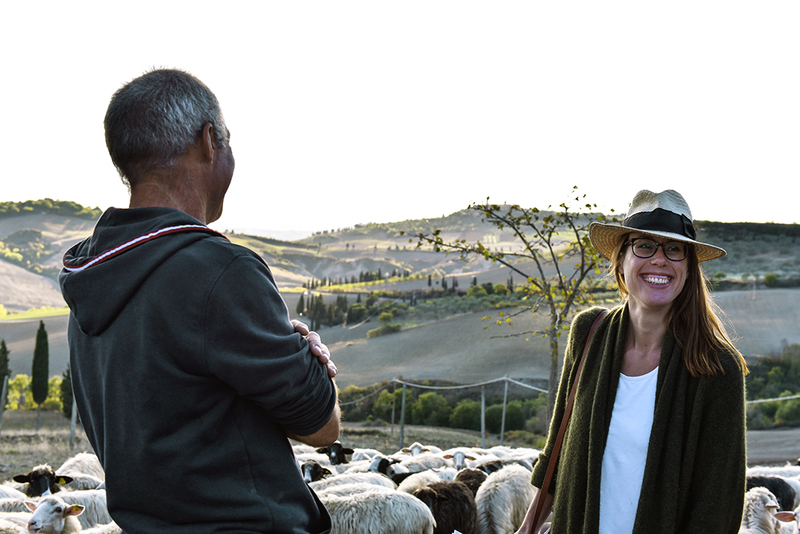 Unfortunately, we didn’t have time to visit the farm’s praised restaurant, but eating that wonderful cheese and enjoying the views of Pienza at sunset definitely made up for it. In a large saucepan, slowly warm up the milk until it’s about 25°C / 77°F, then stir in the cheese starter culture and take the pan off the heat. After 1 hour, add a tiny (!) drop of the rennet, cover the pot, and let it rest at room temperature for about 24 hours. The cheese is done, when the curd pulls away from the sides of the pot. Transfer the milk mixture to a cheesecloth-lined strainer set over a bowl. Keep the milk mixture in the strainer at room temperature for 12-24 hours to drain the whey from the cheese, or until it reaches the desired texture; the whey should be clear. Whisk until smooth and transfer to a glass container, cover, and keep in the fridge for 2-3 days. What made you leave Switzerland? And you don’t like winter? No, I like winter – it’s better for relaxing but here, winter means you have to go in the forest to cut wood. It’s one thing if you have to heat for two months, but if you have to heat for six months, it’s much more work! But it’s better here – you can make olive oil which is a great product. After the butter experience, the olive oil experience is better. It’s great. 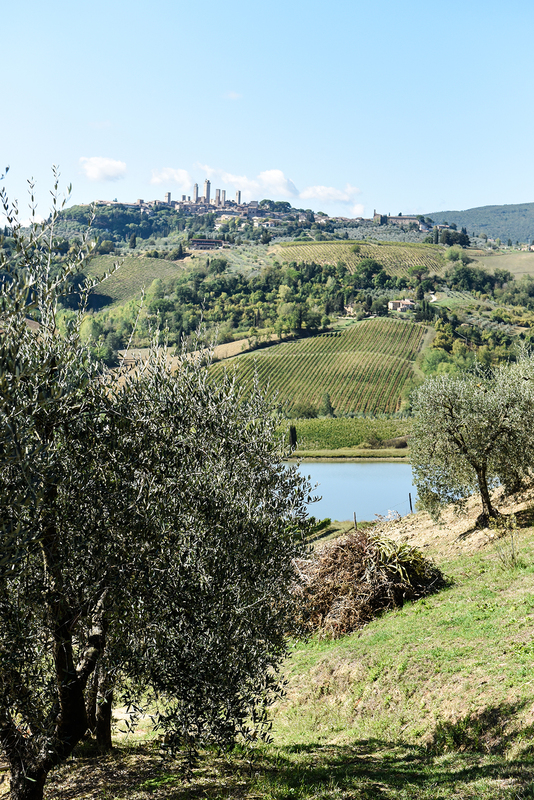 Tuscany is a nice place – it’s very real, and has an old style. In Switzerland it’s difficult. It’s just another experience. Perhaps next time I wouldn’t choose Italy. No, first it was Piedmont because it’s a bit cheaper! But it’s foggy, there are too many Swiss, and the people are really a bit weird (laughing). I would not say that Tuscans are really open, but they are a little bit better! 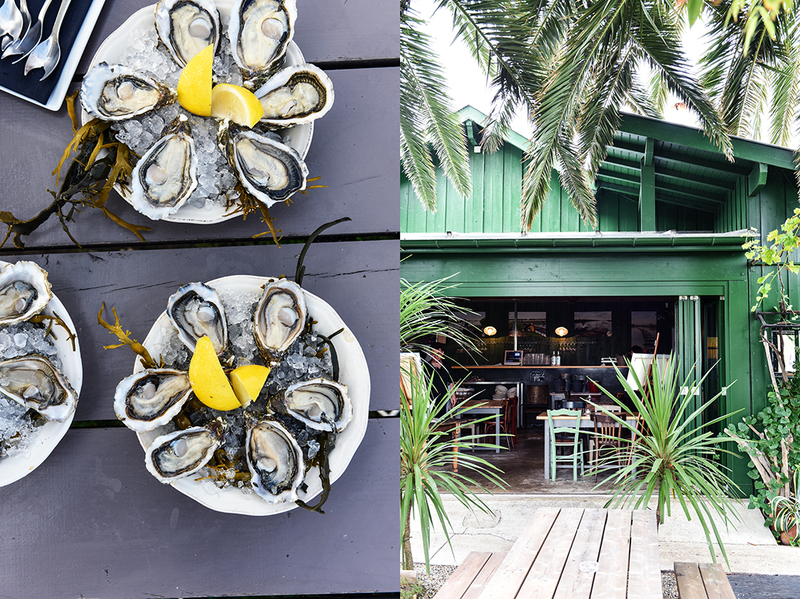 The further south you go, the better the Italians – in my opinion! When did you arrive in Tuscany? How did you find this piece of land? By chance. We were here for the first time. We had a good relationship to the farmer. He gave us time to find the money, he helped us a lot. It was very simple. Was it a smooth transition? Did you have a chance to grow into it? Yes, a bit. Obviously, he had helped us more for the network and less for the cultivation. You have to imagine that these farmers are never really learning, they are just doing what they do because that’s how it’s always been done. Their father did it this way, their grandfather did it this way. It was very simple here. There was no tourism here in this valley. Pienza was sleepy so we really had a bit of this old-style life. Imagine, the farm got electricity in 1980. So, before, life was really simple. Basic. Crop-sharing families in the 60s meant that there were 20 people in four rooms. The farmers didn’t read or write – they didn’t go to school. That’s also Tuscany. How much did you know about farming when you came here? Nothing. I grew some vegetables at home (laughing). Did you have a balcony (laughing)? Was there ever a moment when you felt like giving up? No, no. When I decide something, I go. What do you love most about your life here? To be free here on the farm. Not to be free with the society, but here on the farm. To do what I would like to do and not to make too many compromises – not to do something because it’s convenient. I do what I like to do. When I do what I like to do, I can convince people. If I have to do things that I don’t like to do, I’m not convincing. I think that’s normal! That’s why evolution or new things are really based on ideas that come from inside. The cheese that you produce, is it organic? Sure. Organic in our case is not really a must or even optional. It’s normal. Because who likes to eat chemicals that are used for normal farming? I would say that normal farming is strange. Organic is normal. Just to explain this better, it’s a question of when you want to be convinced of your product, you have to know what you use. The cheese is made with three products: milk, rennet, and salt. Anything more – that might be normal for processed food – is useless. So that’s why real food is organic food – not because organic is really important but because organic is kind of a brand that is about not needing more than what is necessary. Do you believe that organic is the future? I think more local should be the future. Local and seasonal. Organic is already too industrial in certain cases. Do you think that local, seasonal, and organic works for cities? Do you believe that there is enough food if it is produced organically and locally? Definitely, because if you are buying food with a certain concept in mind you waste less. We still waste 40% of food. That’s why all this talk recently of “saving the world with genetically modified crops,” that’s all blah blah blah. 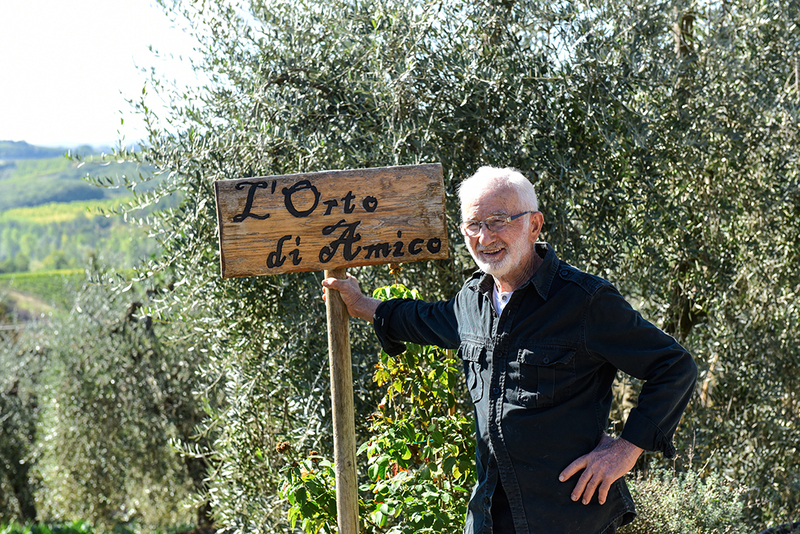 Emiko Davies, who introduced me to you, told me that you make the best cheese in Tuscany. 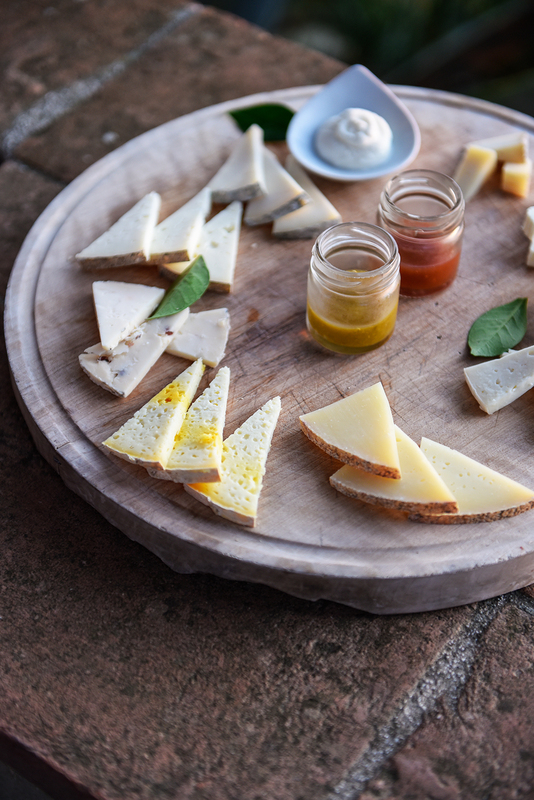 What makes your cheese so special? Our cheese is raw milk cheese. 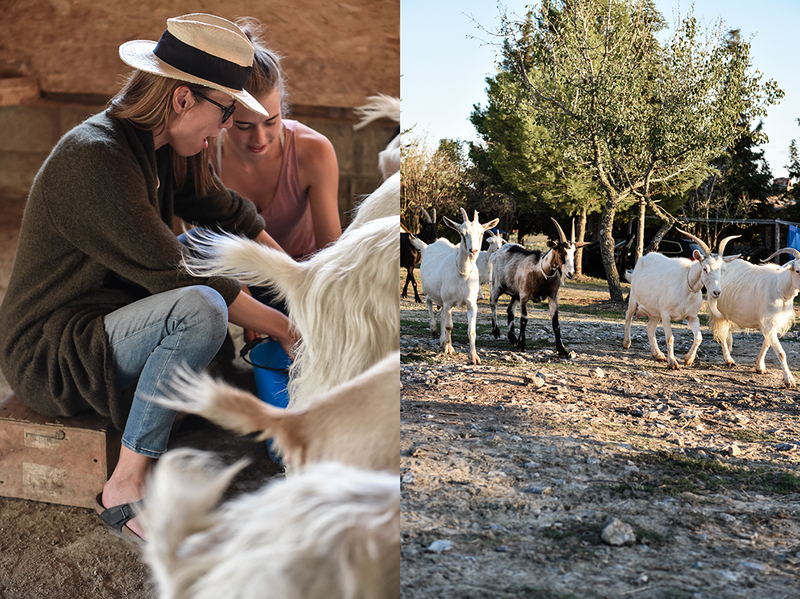 That means our cheese is connected to the animals – the sheep or the goats. What they eat is transferred into the cheese through the raw milk process, because of the bacteria. You have to know that a rainy day milk is different to a sunny day milk. Spring milk with beautiful clover and grass is amazing milk, but also winter milk is amazing because it’s colder. Summer milk is a bit boring, but it’s still great. There is no food! Look (indicating around him), the fields are all brown! Basically, I always tell people we don’t produce cheese. We just help the great milk to become cheese. The rest is done by the bacteria. The chaos of the bacteria gives the cheese its character. The rest is hygiene, how healthy the animals are…that’s our job. So we create the fundament for a great cheese. But the rest is done by the animals, bacteria, and the environment. I read on your website that you found truffles on your land and for a long time you didn’t even know you had truffles here! How did that happen? Because the truffle hunter came and said, “You have white truffles in a really small corner of the forest. Could I have an exclusive deal?” I said, “Sure, I didn’t even know that there were truffles here!” Now, we do truffle hunting with him. He has all the dogs and the knowledge, because you don’t find truffles without it. You could make a truffle cheese, or are you not interested in these kind of mixtures? We do a truffle cheese, but a very small, limited edition because the truffle has a very fragile aroma. If you don’t use chemical aroma you really have to use a lot of truffle and that means a lot of money! Yes, it’s not extremely expensive but it’s not a normal cheese. A few people, for example Russians, they go crazy for truffles. When they see truffle cheese they buy it. But we are here in Italy, not in Russia. You said that you have a closer relationship to some sheep – do you have a favorite sheep at the moment? (Laughing) Great! But no, that would be politically incorrect! If you had one, would you be able to find it? I have a few that I know very well. There is for example one – now it’s difficult to find her (looking around) – her name is Castagna because she always ate chestnuts. There was a time when we had a period of chestnuts here – not chestnuts in the forest but chestnuts for feeding the pigs. We always gave her chestnuts and she would always follow you if you had chestnuts. But she’s very old – she’s about 8 or 9 years old. Really? And she is one of them here? Yes, but she has a bit of a different relationship to humans because she obviously remembers all these chestnuts! My love for cheese is deep and passionate. 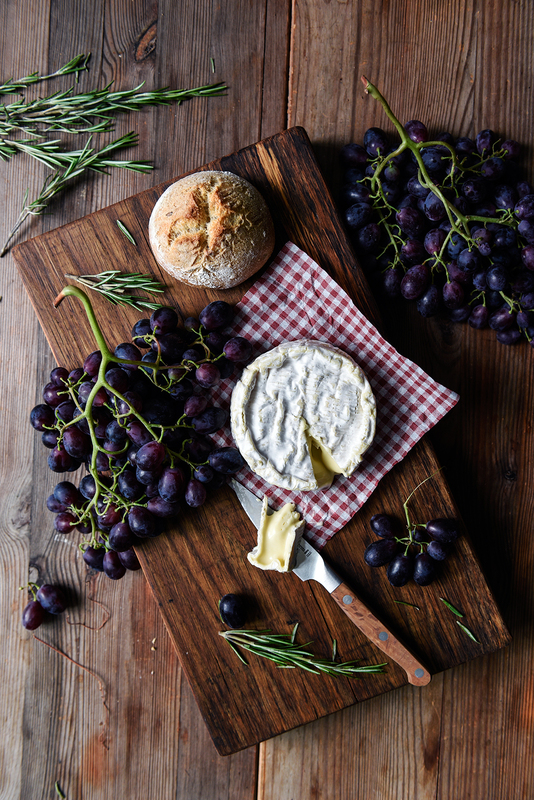 I embrace the whole variety of soft and hard, young and old, of cow, goat, and sheep milk cheese without skipping a bite. However, I always had a particular pull towards the oldest, runniest, and strong-smelling examples. In my late teenage years, I spent a romantic weekend in Paris. Aside from the usual sightseeing spots, the strolls through the stunning Louvre and Musée d’Orsay, long walks along the Seine and busy Boulevard Saint-Germain, I went straight for the city’s boulangeries, pâtisseries, charcuteries, and fromageries. It was my first proper food trip, constantly carrying – and nibbling from – bags filled with baguette, croissants, pâté, tartes, éclair au café, and cheese. Whenever I spotted a bench or a park, I declared it my picnic zone and made it a moveable feast. It was summer and I bought so much cheese that I had to find a way to store all these rolls, rounds, and triangles. Our hotel room’s mini bar seemed like the only suitable place to keep my fragrant treasures. Just as we left, as I collected my food and other belongings, I noticed a particularly strong odor of a very aged camembert escaping the tiny fridge. In that moment I pitied the future guests of our room, and it dawned on me that it would take days for it to recover from my visit. Camembert always had a very special place in my heart. When it’s young and firm, still a bit white and crumbly in the center, I enjoy it at breakfast on crunchy baguette. The flavour is mild and still developing. But when it’s aged and so soft that it practically melts inside the white rind – my favourite – the cheese is at its tasty peak. 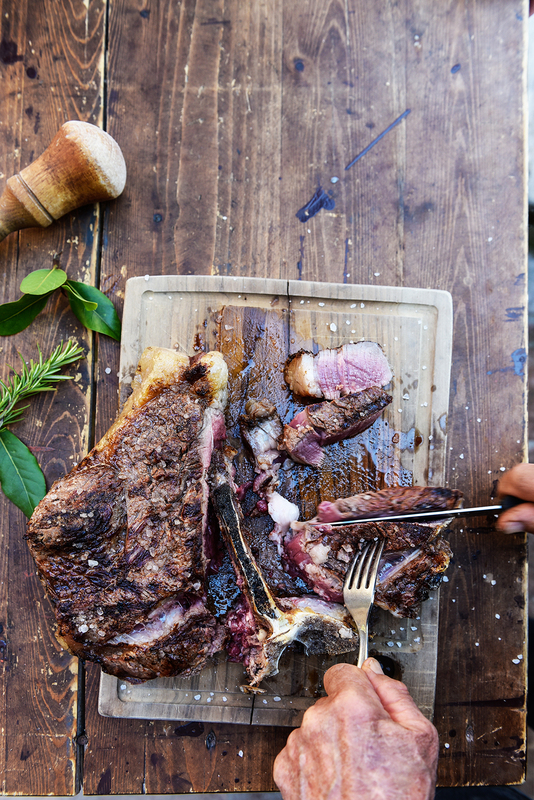 Then it needs a glass of full-bodied Bordeaux, or ripe fruits or concentrated chutneys. 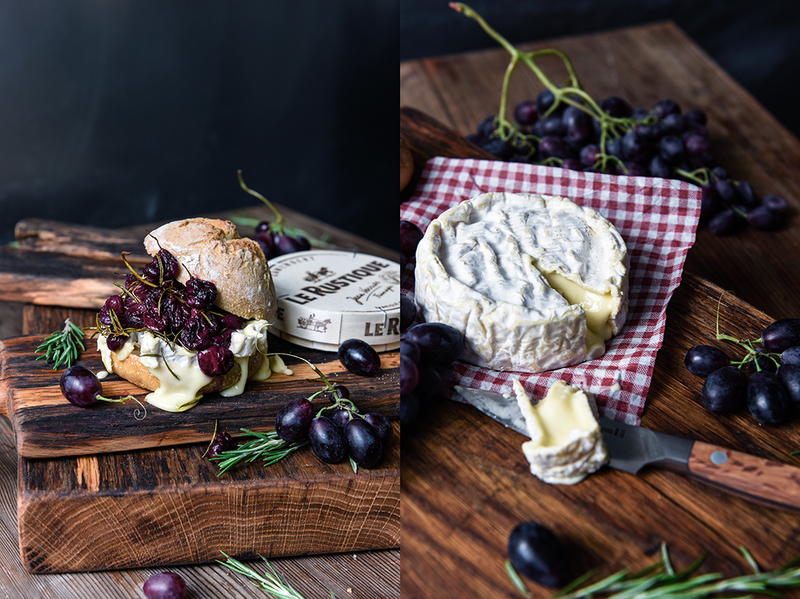 Le Rustique manages to capture this quality of rich ripeness perfectly, the cheese is strong and creamy, packed with a sharp taste that makes it so special. 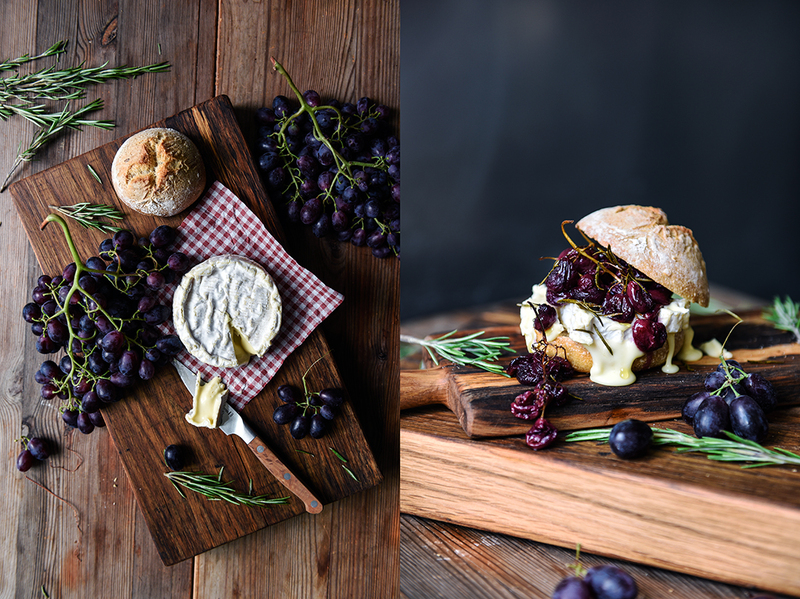 So when the cheese makers from Normandy asked me to create a sandwich recipe for their famous round product wrapped in red gingham cloth, I knew it would need a potent partner. 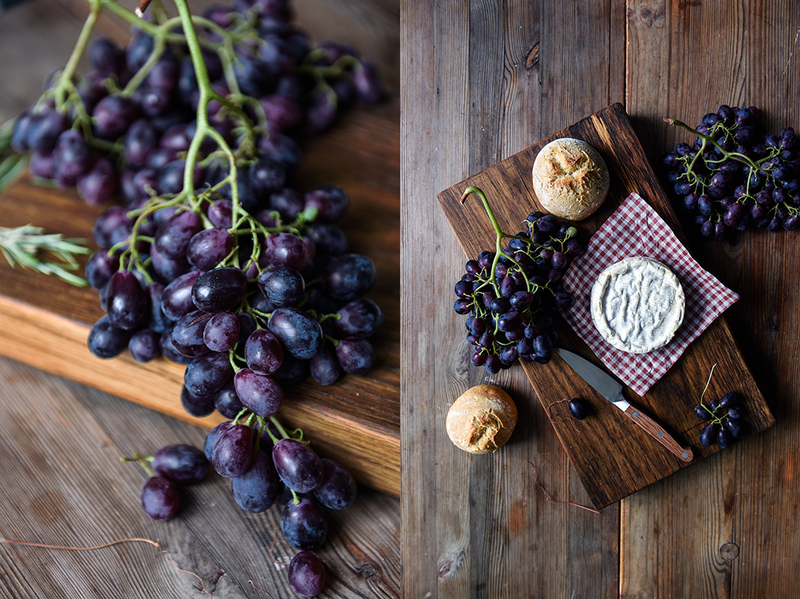 Grapes and cheese are a common couple, but when you roast the little fruits in the oven until they shrivel, their flavour concentrates beautifully. 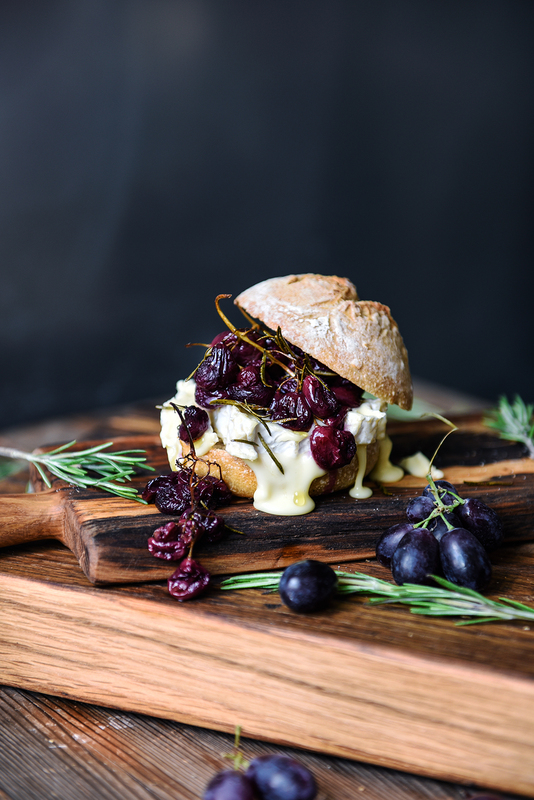 I balance their sweetness with fresh rosemary to add woody tones to a rather opulent sandwich of ripe camembert and roasted grapes. 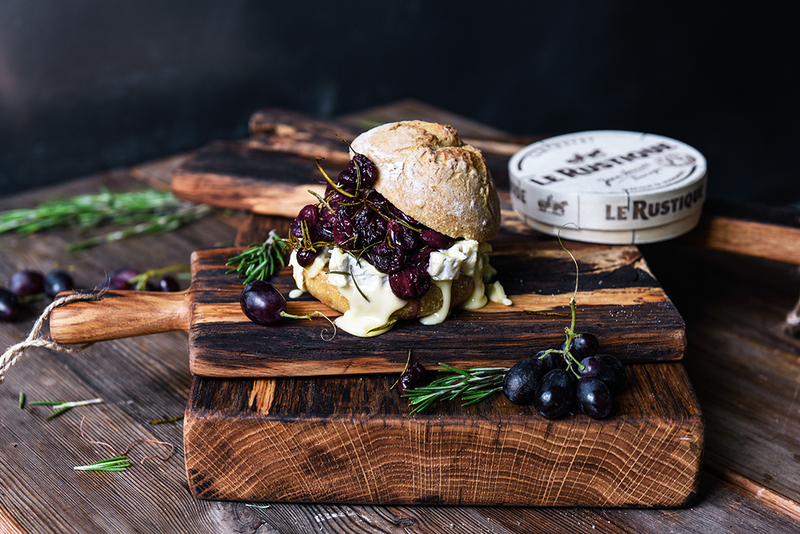 Thanks to Le Rustique for sponsoring this post and reminding me of the little culinary adventures that I have in my life through one of my favourite treats: the wonderful world of cheese. Preheat the oven to 220°C / 425°F. 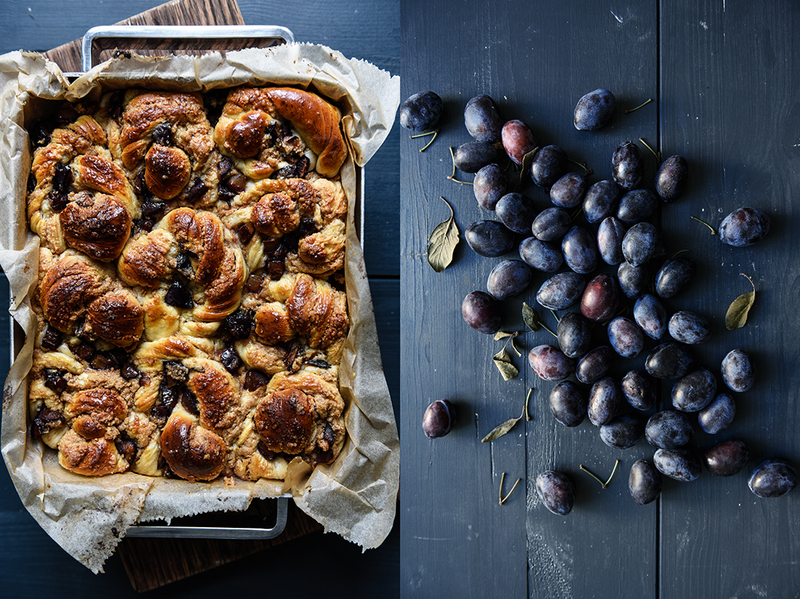 Place the grapes and rosemary in a medium baking dish. Drizzle with 2 tablespoons of olive oil, gently toss to coat, and season to taste with salt. Roast for 30 to 35 minutes or until the grapes are soft and a little shriveled. 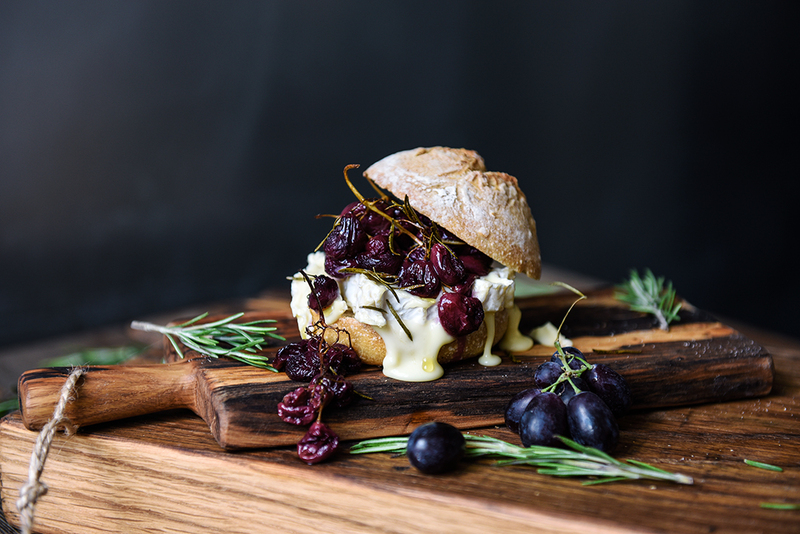 Divide the camembert among the bottom halves of the buns. 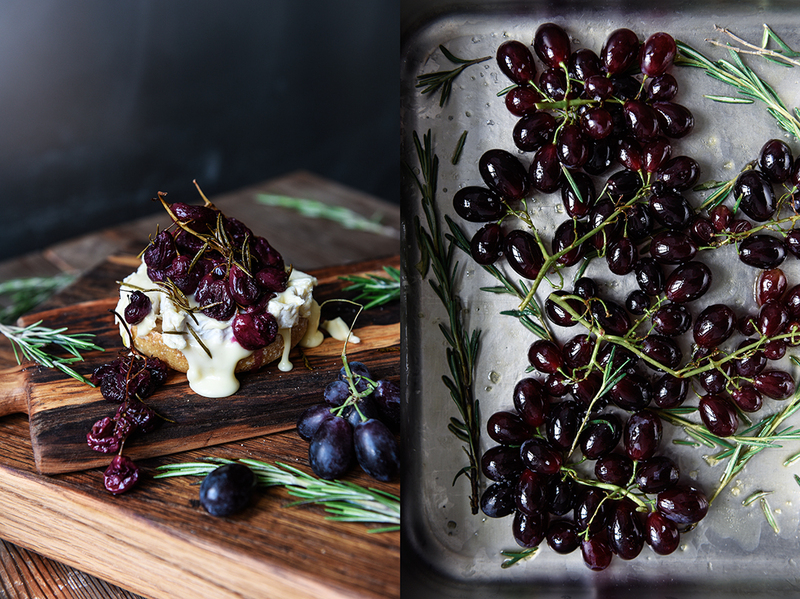 Snip the grapes off the vine and arrange on top of the cheese and sprinkle with the roasted rosemary. Place the top on each bun and enjoy. 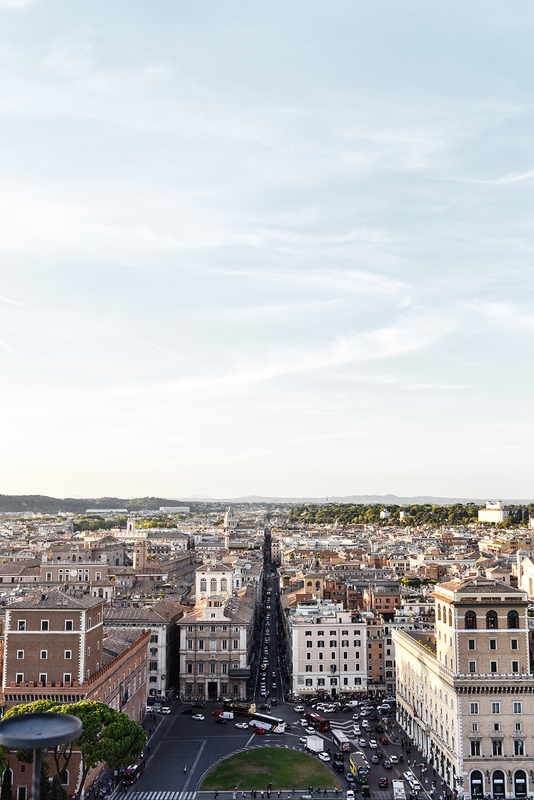 Italy is a luscious feast, its abundant beauty captures all your senses. As soon as I cross the border into the boot, I don’t even know where to start feeding my cravings, which food I should try first, which wine I should pick to fill my glass. You can’t help it, you fall in love with this country, over and over again, every day. 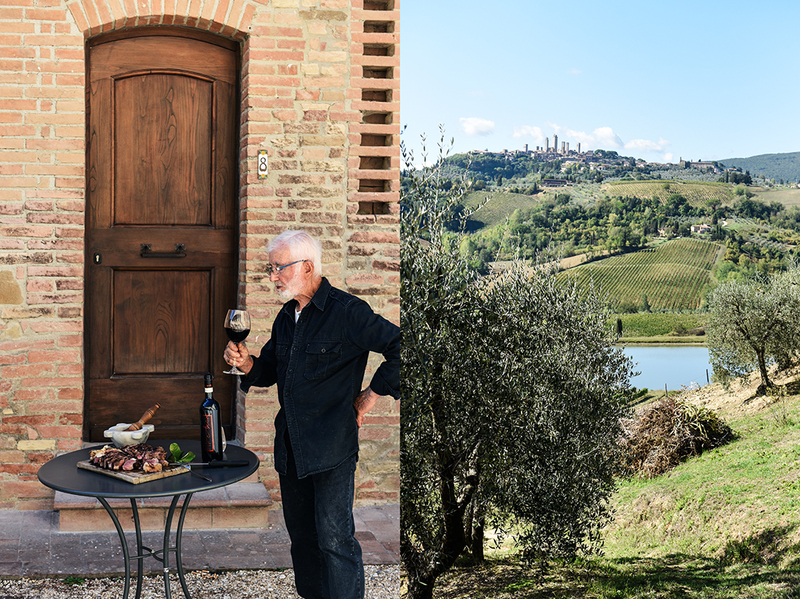 And when you leave, you don’t know how you should ever put anything else into your mouth than the most perfect Truffle Carbonara from that tiny Trattoria in Orvieto, or the dark Chianti from that dreamy Fattoria enjoying spectacular views over San Gimignano. The kitchens and tables are always filled with the most wonderful treats waiting to be shared, the people have their own pace and a smile for you at any time, the past is treasured yet critically considered and wisely woven into the present. 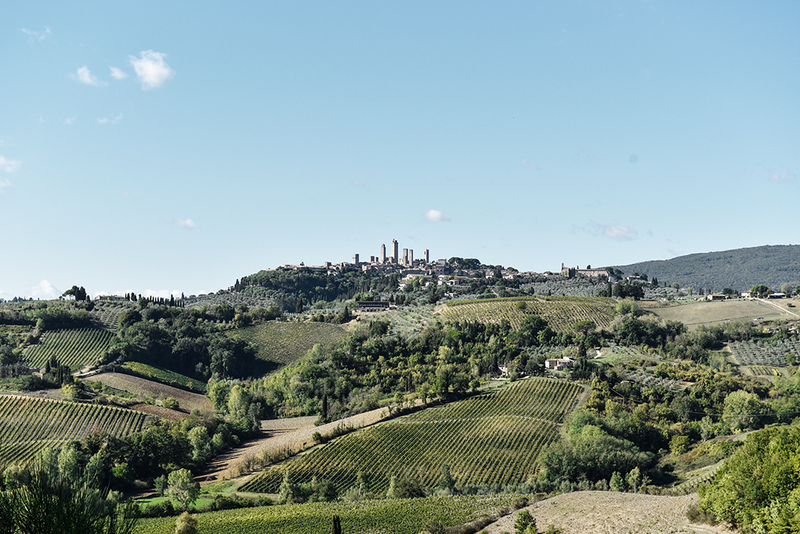 We arrived in Florence on a cloudy day, the Tuscan hills spread out softly like open arms welcoming us to the next stop of our culinary trip around the world together with Zwilling. Before you even enter the region’s capital, before the man-made Renaissance buildings, sculptures, and gardens take your breath away, it’s nature’s creations, the landscapes that you’ll save in your head and never forget. It’s a stunning scene, seemingly peaceful in warm, earthy colors, but like a romantic painting, you can feel that there’s always the potential for more, a hint of drama in the air. Bright blue skies brushed with pastel-pink strokes are the background for cypress trees swaying silently in the warm wind, the darkest clouds part suddenly and let the sun break through to light up this glorious kingdom. The farmers markets offer the most colorful produce. 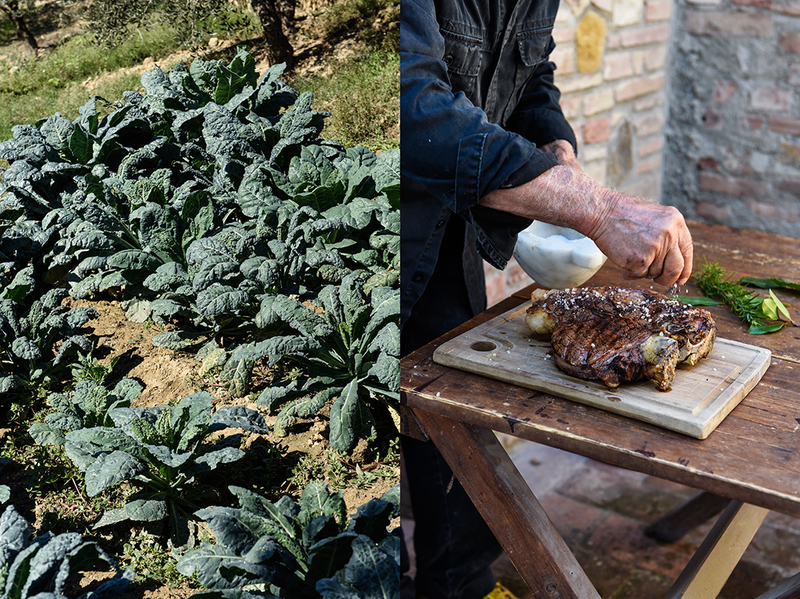 Fruits and vegetables grow happily under the Italian sun, and they are proudly celebrated in the country’s various regional cuisines. Italian cooking follows one philosophy: use only the best products, don’t distract from their quality, and be guided by sensible simplicity. 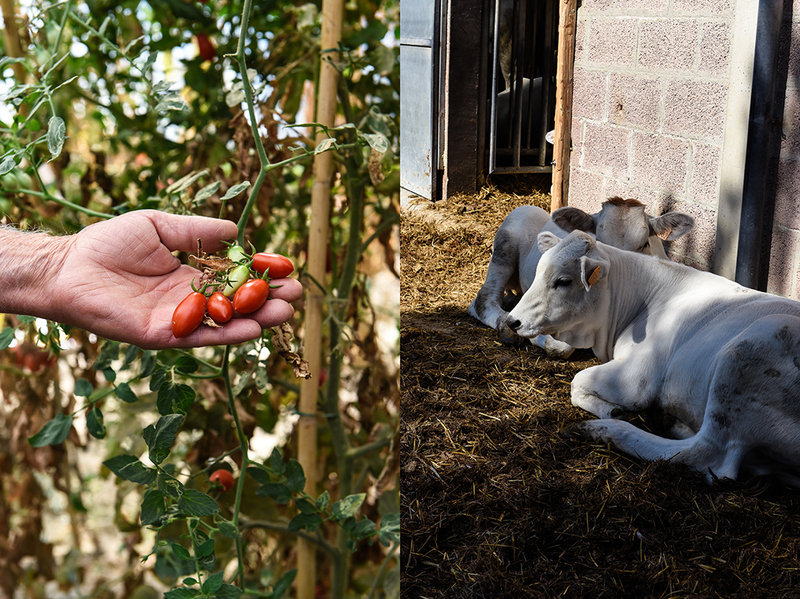 Especially in the countryside, you can feel a lot of respect for nature and the will to go back to a more natural and sustainable way of growing produce and raising animals. The younger generation takes a look into the past to learn from the precious heritage of their ancestors. 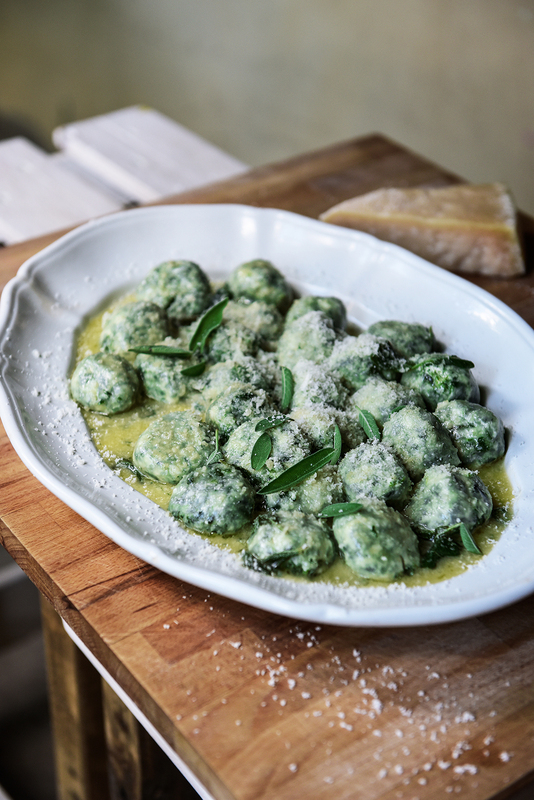 Traditional recipes are being modified yet never erased from the menu, they have always been an important part of the culture, they are memories of the childhood of every Italian and special treats for the rest of the world. Somewhere in the soft hills behind Florence, between olive groves and cypress trees growing tall into the sky, you can find a heavy iron gate framed by a washed out yellow wall. If you walk though this gate, you’ll see a group of old houses, a former farm, overgrown with ivy, the roofs covered in terracotta tiles, and the wooden shutters painted as green as the lush trees and bushes along the gateway. 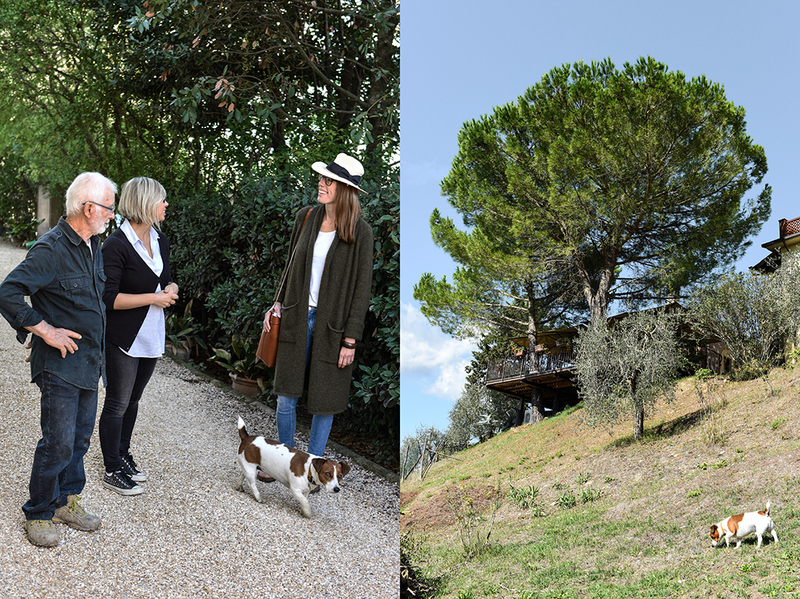 It’s a little paradise in the heart of Tuscany, it’s the home of Emiko Davies and her husband Marco Lami. 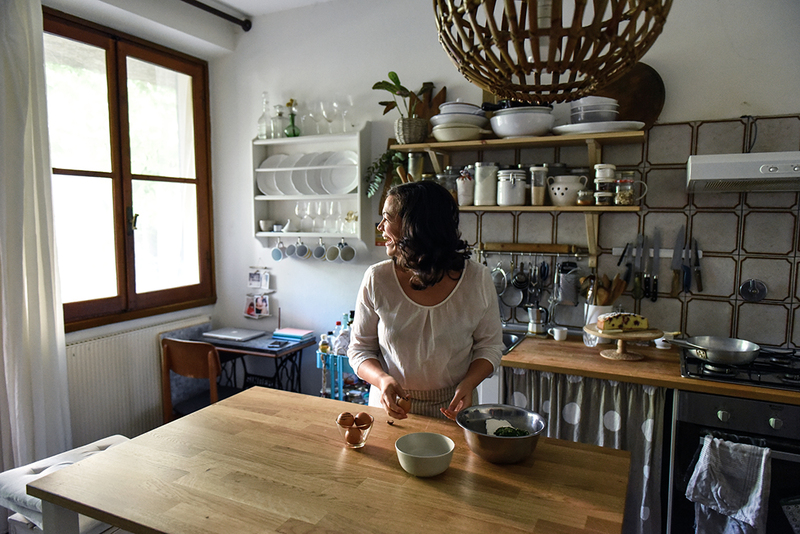 Emiko Davies is the renowned author of two celebrated cookbooks – Florentine: The True Cuisine of Florence and Acquacotta: Recipes and Stories from Tuscany’s Secret Silver Coast – and she’s also the voice behind her popular food blog of the same name. She lived in many countries, half Japanese, half Australian, and the daughter of a diplomat, she’s seen the world, but when she met Marco, she lost her heart to this man and his home country. 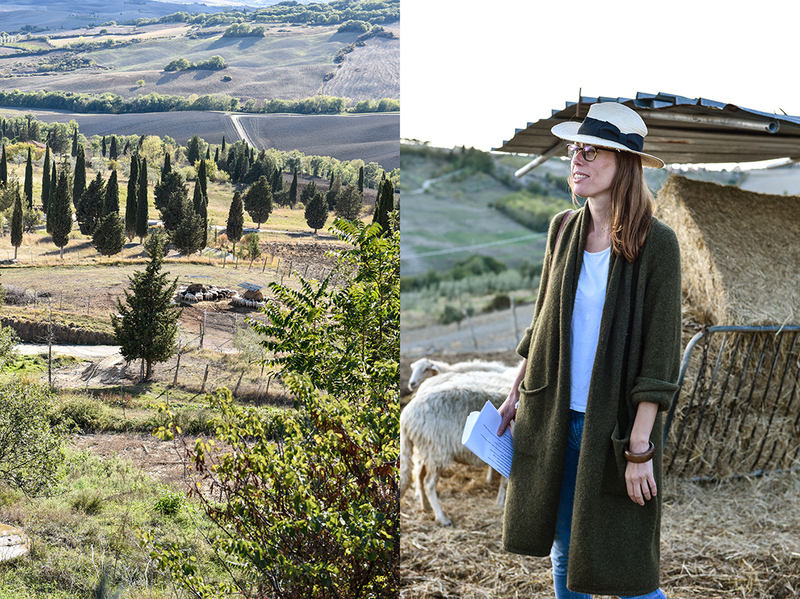 Emiko loves food and cooking, she has a background in art history and fine arts, so Italy, and especially Tuscany’s traditional cuisine is a vast field for her to explore. 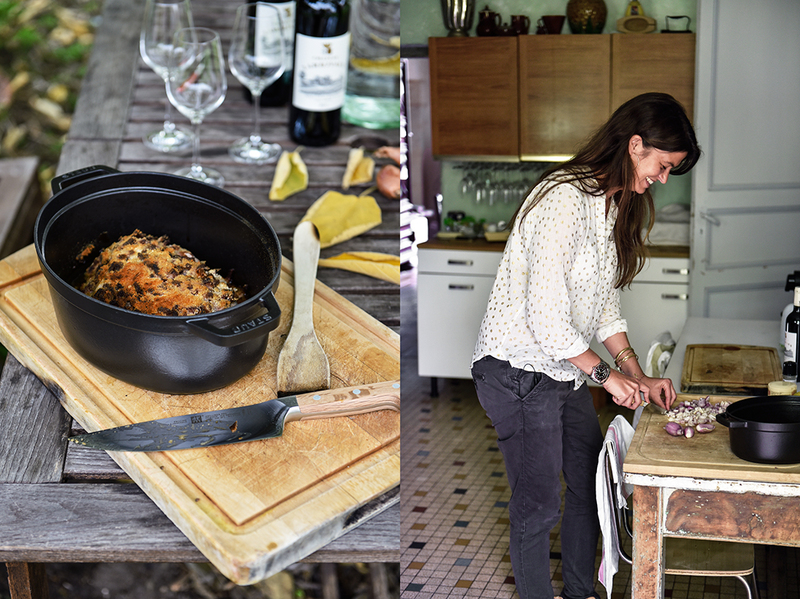 She’s fascinated by all the regions and landscapes, towns and villages, treasuring their own recipes. The style is Italian, always, but the interpretation is distinct. 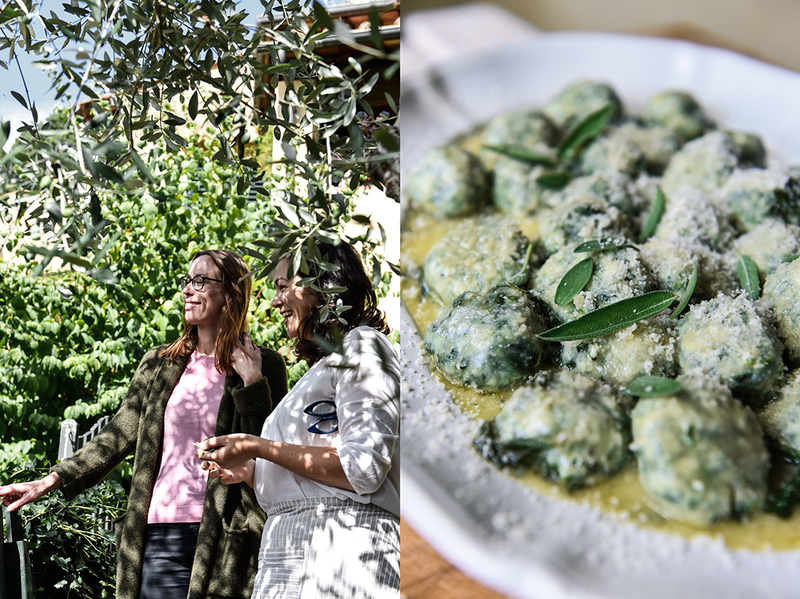 Everything is done for a reason in Italian recipes: the way an ingredient is used, the season and region that it is used in shapes every recipe. And its origin often lies in the past. Emiko’s eyes sparkle when she talks about historical cookbooks, about exhibitions at the Renaissance Palazzo Pitti in Florence showing still life paintings of solitary fruits at the Medici gardens. 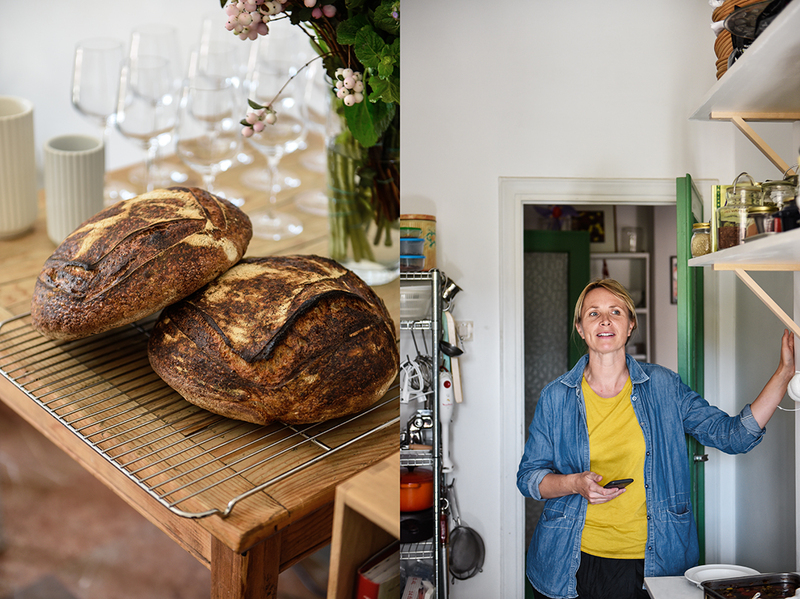 She finds inspiration for her creations at every corner, at the markets, in conversations with the farmers who share their family kitchen secrets with her. She often finds that many formulas, certain combinations and preparations, haven’t changed since medieval times. 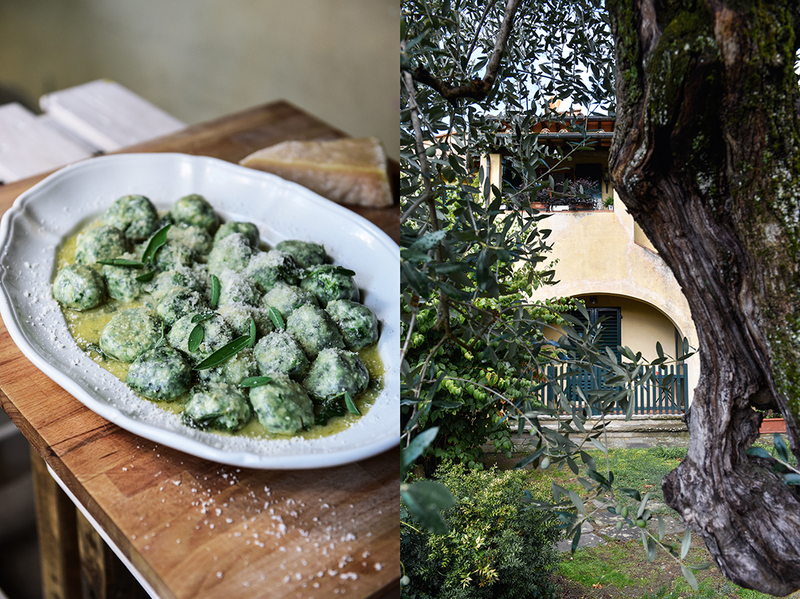 The food that’s been cooked in Tuscan kitchens for centuries still finds its way onto today’s tables, the stories behind these recipes are still shared when the families sit together. 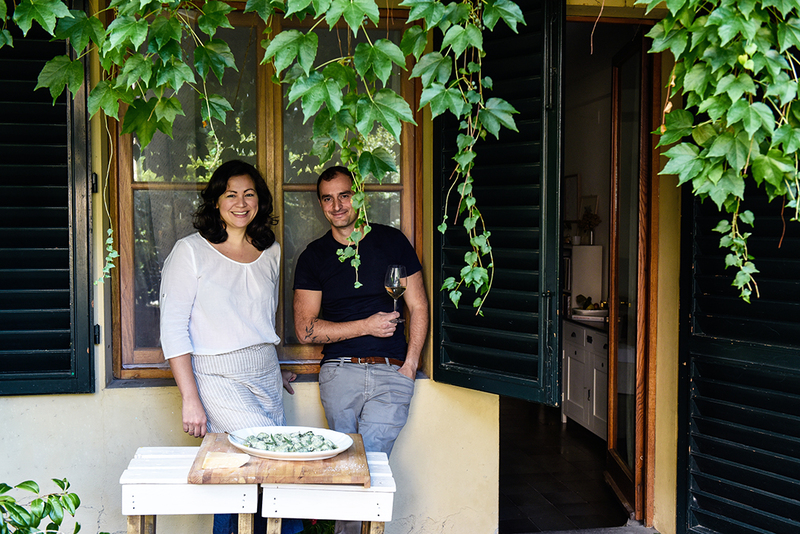 Emiko and Marco, both experience food and wine with all their senses, but they also involve their intellect to discover new fields to learn from, to find new stories and flavors to stimulate their creativity. It’s a passion vividly lived in their household and lovingly passed to the next generation. Their little daughter is already a skilled cupcake and cookie baker, watching what happens in her parents’ kitchen with a curious eye. 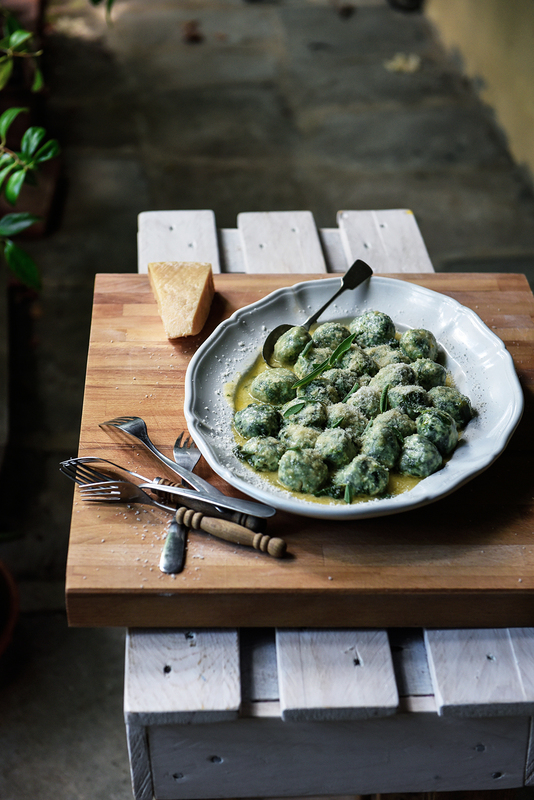 When we met, the young girl shared some of her baking secrets with me, just like her mother who prepared the fluffiest “naked ravioli” for us – Florentine spinach and ricotta gnudi. 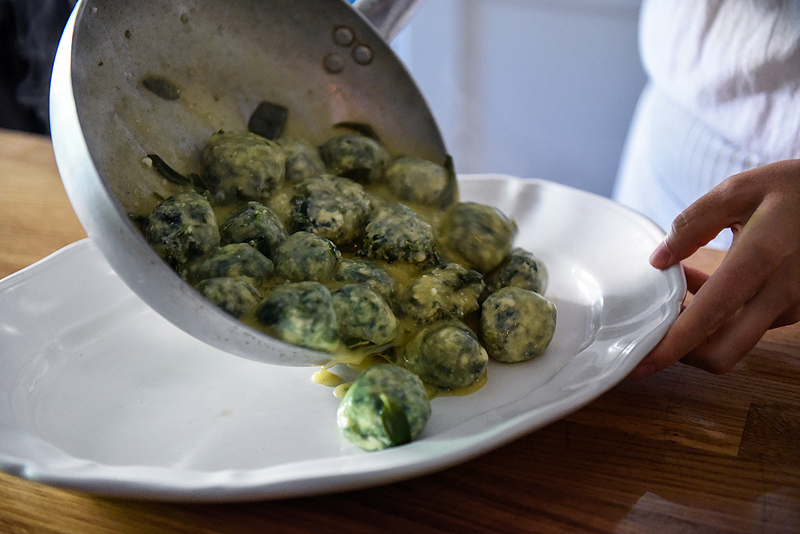 Mix the ricotta, finely chopped spinach, eggs, pinch of salt and nutmeg together in a mixing bowl. You should have a thick, compact mixture. Place the flour in a shallow bowl. 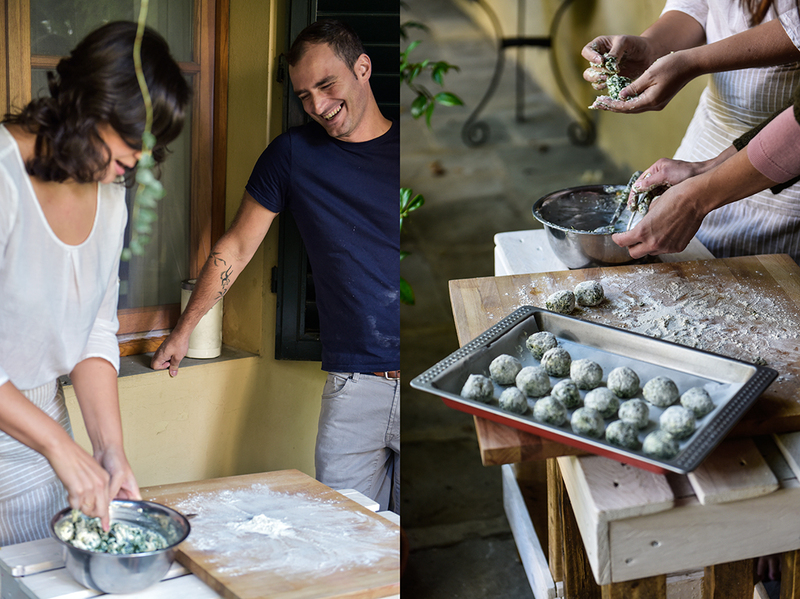 With hands, roll walnut-sized spoonfuls of the gnudi mixture in your hands, and then in the flour until well-coated. Place on a lightly-floured board until they are all ready. Prepare a large pot of water (salted with a spoonful of salt) and bring to a simmer. Carefully drop the gnudi into the water and cook for about 4-5 minutes or until they begin to float to the surface. In the meantime, prepare the sauce by melting the butter in a wide pan over medium heat with the sage leaves. When butter is melted and before it begins to brown, add about 2-3 spoonfuls of the gnudi water and swirl the pan to create a thick sauce. Season with salt and pepper. 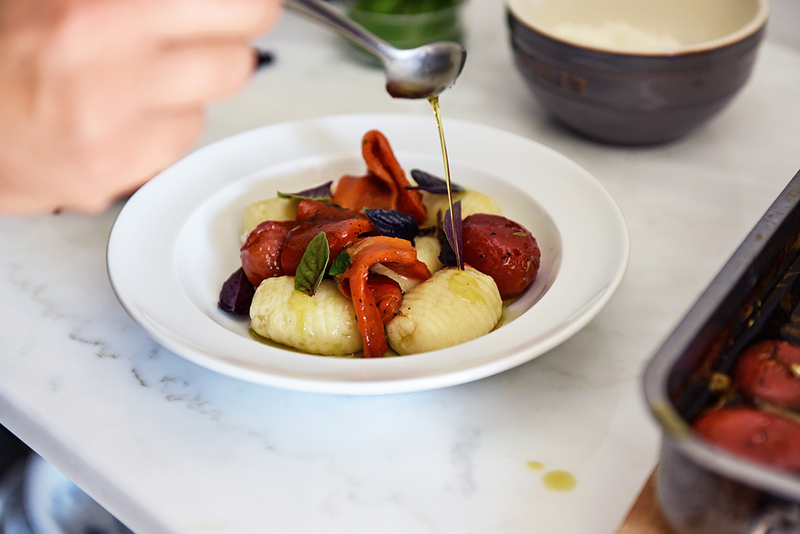 When gnudi are ready, remove them from the water with a slotted spoon and place in the sauce. Turn heat to low and swirl to coat the gnudi gently with the sauce. Serve immediately with the cheese. Emiko, can you tell us a little bit about yourself? I’m originally from Australia, but have been living in Florence since about 2005. I live in Stettignano, which is a little neighbourhood, hilltop town just outside of Florence and here from home I cook and write cookbooks and look after this wriggly one (her daughter, Mariú). I also write a lot of articles for other publications as well. 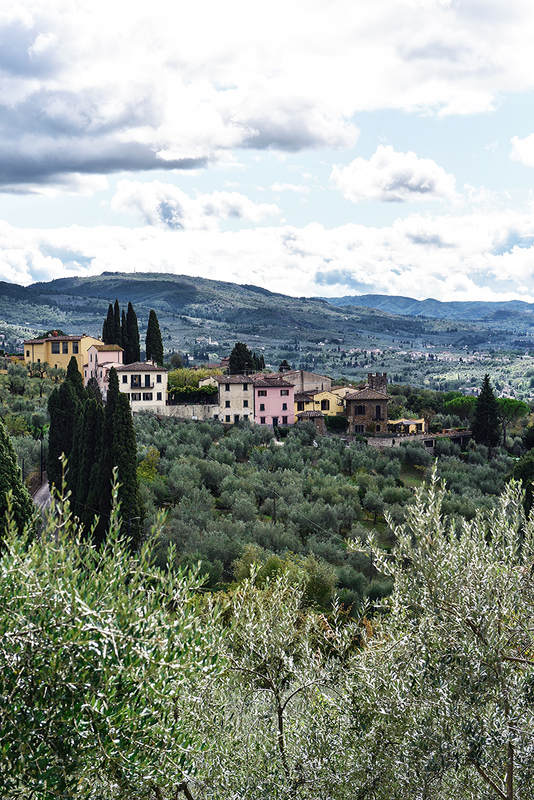 I’m originally from San Miniato, which is just outside Florence. I work with wine. I work as a sommelier in Michelin star restaurants and I help Emiko, or I try to help her as much as possible with cooking and looking after Mariú. 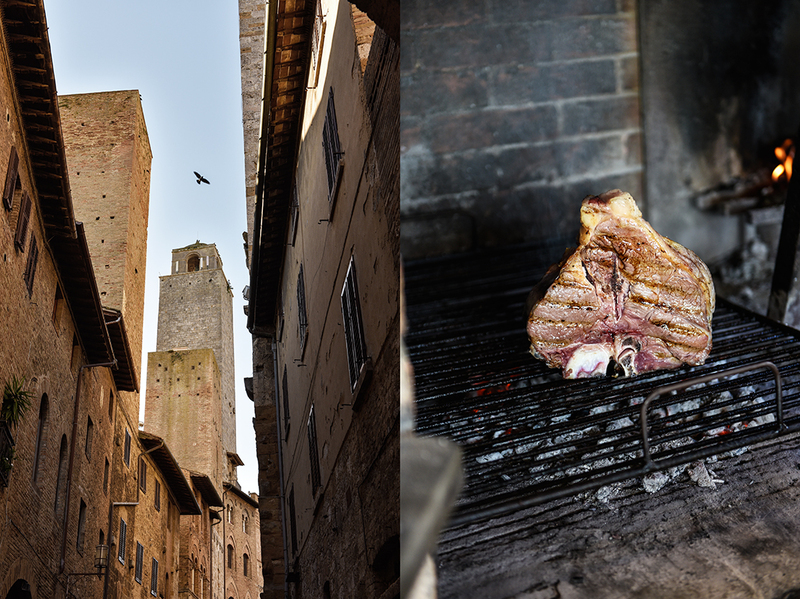 Why did you choose to dive into the cuisine of the Maremma region for your second book, Emiko? The second book was basically inspired by 6 months where we lived in Porto Ercole, which is a little fishing village essentially, it’s quite small on Monte Argentario. 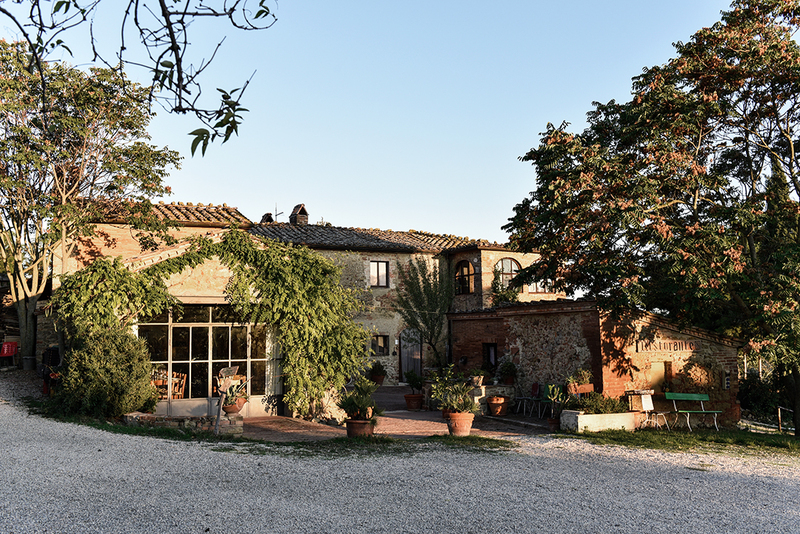 It’s on the very, very, southern part of Tuscany, on the coast. It just struck me how different that part of Tuscany is from Florence and from the parts of Tuscany that are better known to most people. 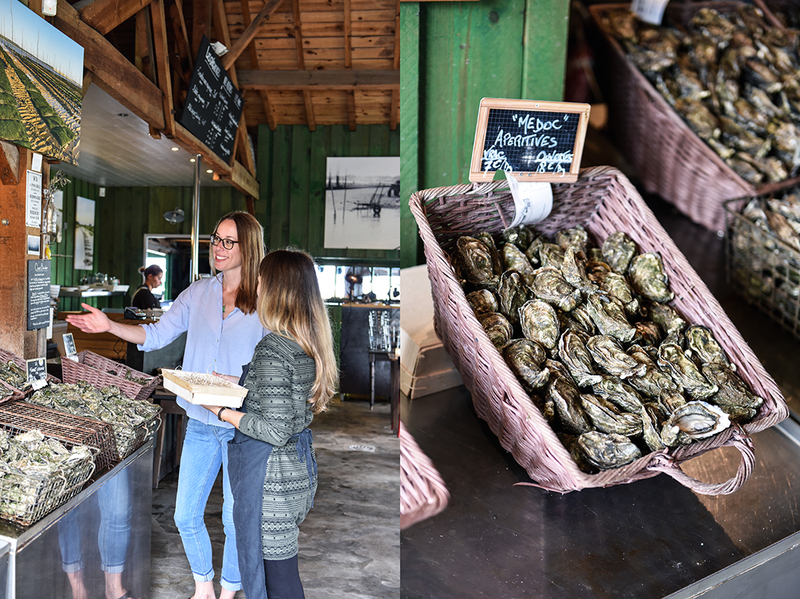 So I wanted to write about the cuisine there partly because it was so interesting being on the coast and having a cuisine that’s inspired by the seafood, as well as the mountains from that area. It’s really rugged and wild, and a mountainous area. And partly because it’s not very well known. 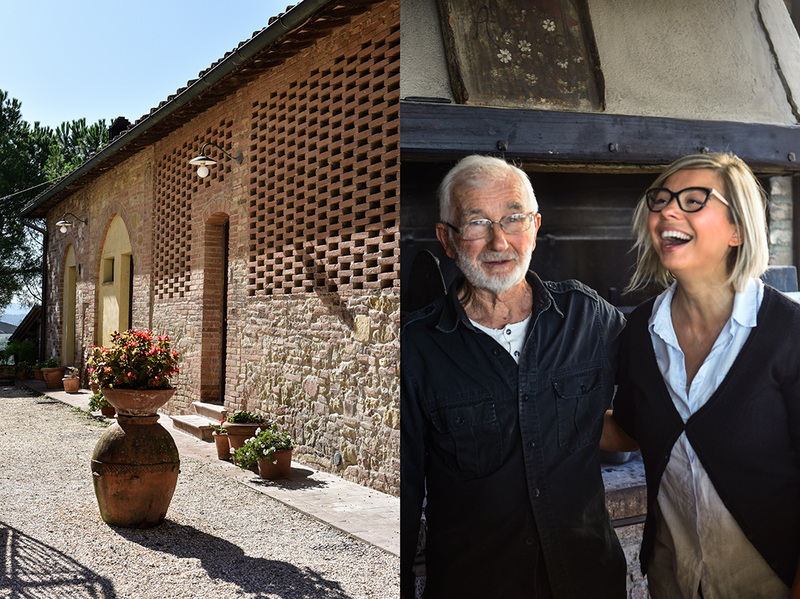 So I wanted to tell the stories of this place that people don’t think of really as Tuscany. 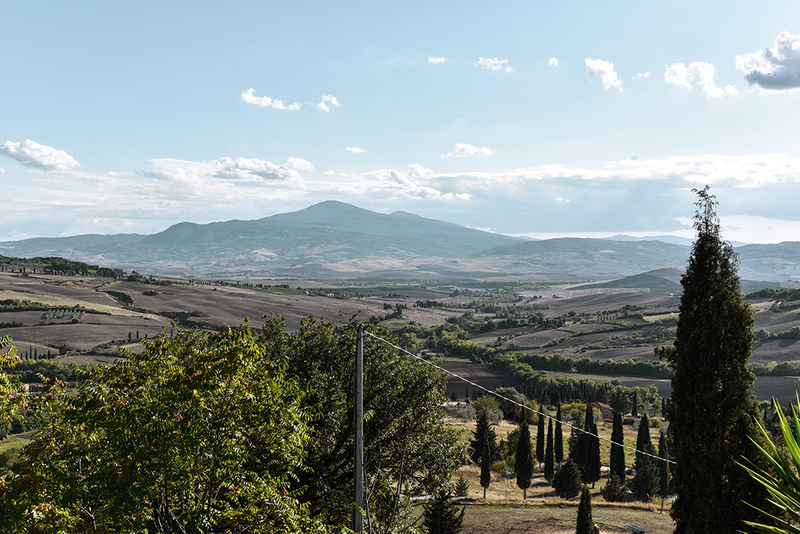 When most people think of Tuscany, they think of these rolling hills and olive groves and cypress trees around Florence, the Chianti or Siena, but I don’t think they think of the seaside, islands, and mountains, really. How important is the connection between the recipes and the region where they come from? 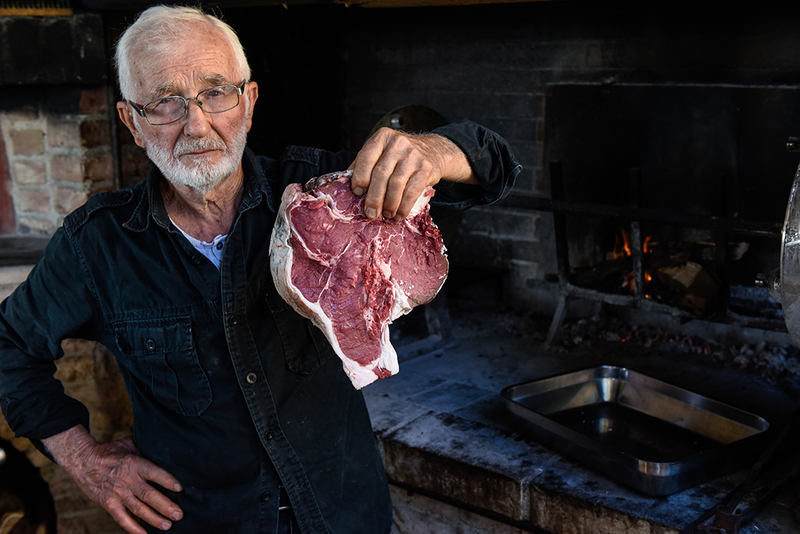 In Italy, I think that every recipe is so connected to a place, either the landscape or the actual region. Even within Tuscany. This is something I wanted to show through the two cookbooks that I’ve written, even within one region the recipes can change from town to town. As many towns as there are in a region, you have that many recipes in many cases. With Aquacotta, talking about the Maremma, that was really evident. Even with towns that are only a 15 minute drive away from each other have their own versions of an aquacotta, for example, which is a soup. 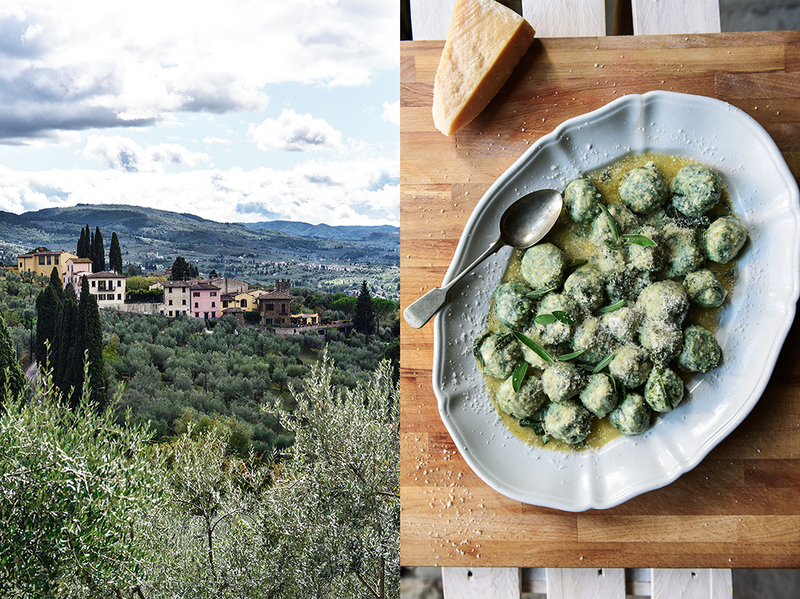 Florence itself, has dishes that you only find in the city of Florence. So not only are they Tuscan, they’re actually Florentine. 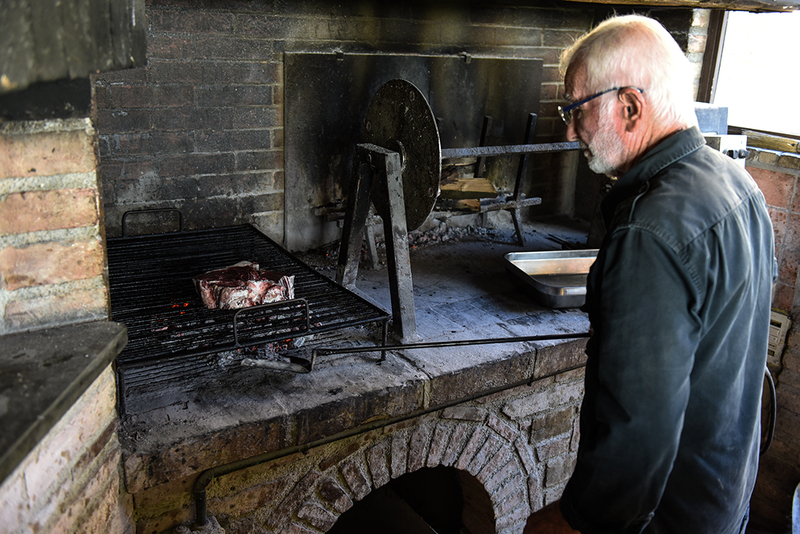 Even a ten-minute drive outside of Florence, there are some dishes that you just won’t see anywhere else outside of that invisible boundary. That’s true for all of Italy – it’s the same! – which is why I really like to write about a place that I get to know by living here or even visiting. I find it just endlessly fascinating how a landscape, or the town culture or a city culture – but even smaller than a city, like what they call in Italian a paesina, a little town – changes from one place to the next. So first it’s a place and then the recipes? Yes, although sometimes it’s the recipe first and I ask “why is the recipe just like that? Is it always just like that?” And then you get to know that landscape and “Oh! 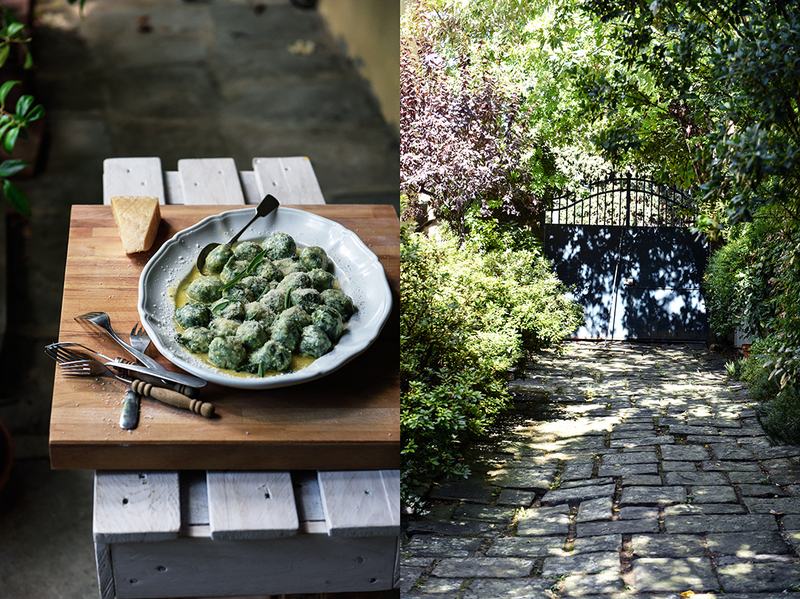 It’s because the landscape is this way, or there are certain things that grow there, or certain things that have always grown there, or there are certain things that you only see in a particular season.” Everything has a reason, I find, with Italian recipes. There’s always a reason why there’s that particular combination of ingredients in a recipe and it’s usually to do with the landscape. 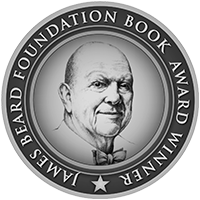 I have a book that I’m starting to work on, which will be family recipes. There will be a little bit of Tuscany, but also a little bit of some other regions based on Marco’s family history. So we’re going to the south of Italy, and also going to the north of Italy, and then meeting back in the center. How do you develop and approach new recipes for your books? It depends on how I come across it to begin with. 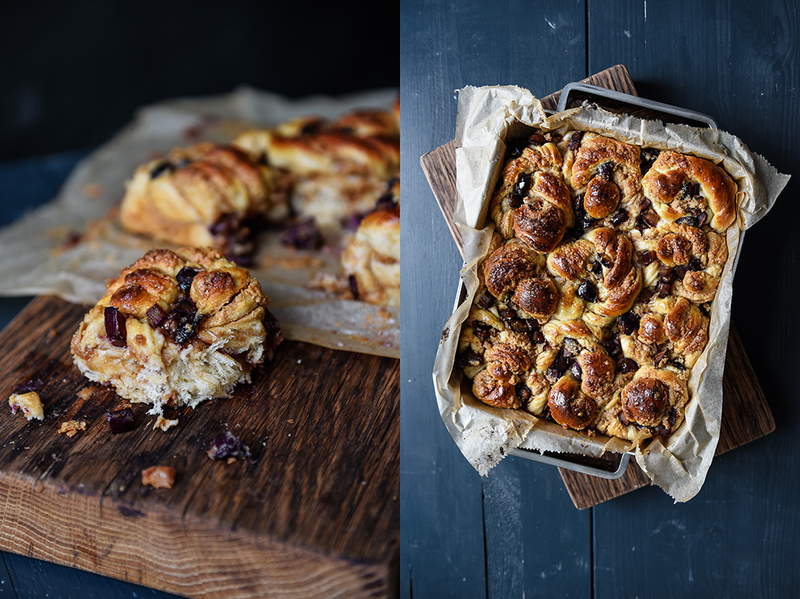 But the way I usually approach a recipe, it’s often inspired by the market or the season, or visiting a place that I’ve just been to where I’ve tasted something and I want to recreate that recipe. Or if it’s the market, it’s because I’ve seen something really wonderful at the market and I really want to do a recipe. Then I really have to delve into finding out what is really the most traditional version of that recipe and why is it that traditional. So I often go into the history of that dish, I look at historical cookbooks – I love reading historical cookbooks! – so I’ll look at those, maybe talk to people. If it’s at a market, often people at the market know something. Or if it’s not from this region, then I try and talk to somebody who is from that region. So for example, I’ve got sitting in my fridge at the moment a recipe for quince. I found these beautiful quinces at the market and I just couldn’t resist – they looked so beautiful! – I just bought a whole kilo of them and then I thought later, what am I going to do with them? I wanted to try a recipe from Mantova (Mantua) and I just happened to be at the market with a friend of mine who is from there. She told me her aunt’s recipe for Mostarda Montovana, which is a really spicy fruit compote that you eat with cheese. 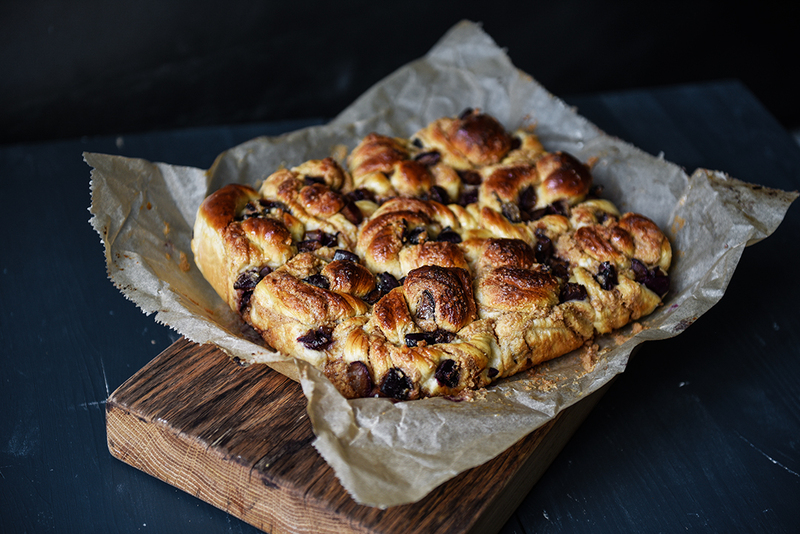 That recipe is one that dates back to about the 13th century and there are many different ways to do it but I was looking at the very traditional ways. It’s amazing because it hasn’t really changed much since then. The recipe that my friend, Anna, gave me is more or less the same recipe that is recorded in cookbooks from centuries ago! Does it happen very often that you find recipes that haven’t really changed much over the past few centuries? Yes, a lot! Particularly a lot of Tuscan recipes are like that with no changes over centuries. They’re the same and that is also something that I find really fascinating because I come from a country which is so young and doesn’t have that deep rooted food culture. It’s really a mishmash of things brought from all over the world, in one place. So I’m always fascinated by these old, old recipes that haven’t changed for several hundred years. Where do you find inspiration for your creative work? So when you don’t know what to cook, you go to the museum? Yes! I did actually find them in a painting. She said they’re called Francesca apples and they’re from Florence and I saw them in one of these paintings… It’s amazing! Marco, what makes Italian wine so special? That’s a big question! So the special thing about Italian wines is – actually it could be a bit of a double-edged sword – is how complicated it is. A lot of wines in the world, new wine regions, even old wine regions, are quite simple to understand. 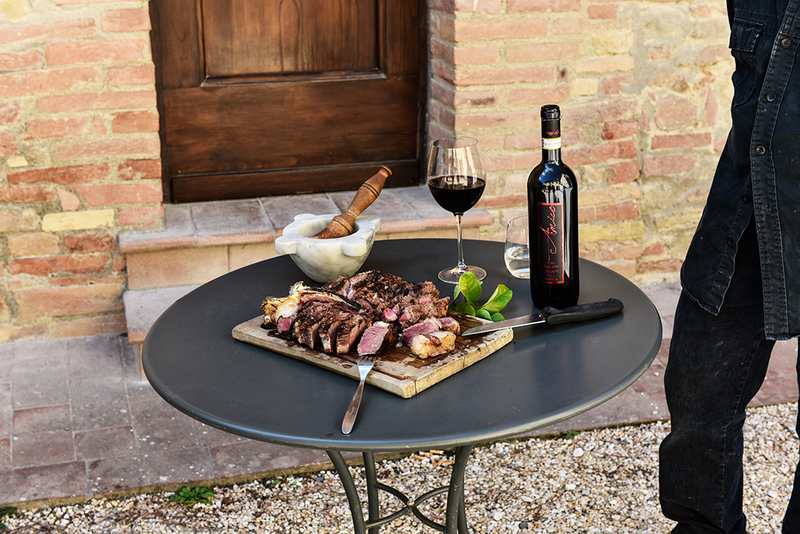 Italian wines, what makes them different, is quite similar to the food. 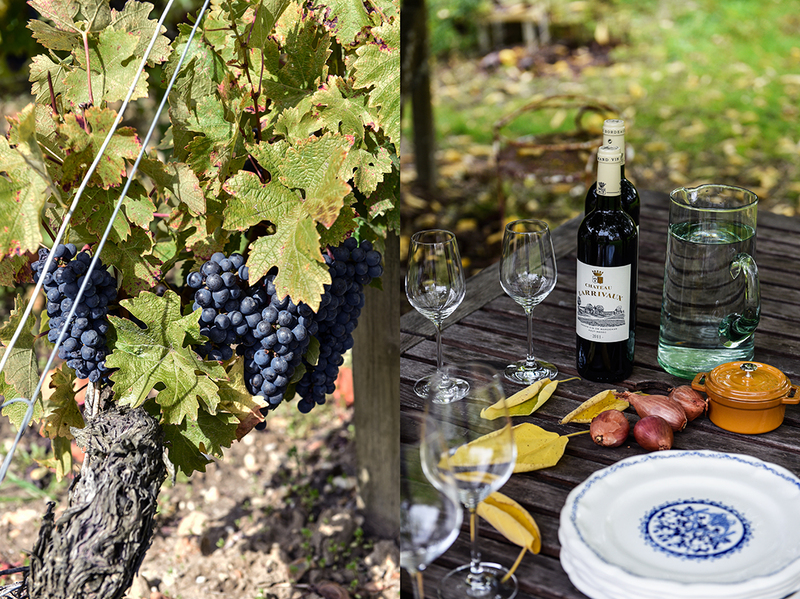 Every region has its own grapes and each grape is treated in a different way to make different types of wines. There are a lot of different wines to be discovered. So there are a few famous wines, a few famous names, but what is actually interesting is what’s hidden under those famous names in each of the 20 regions. Do you have a favorite wine region? No, I don’t have a favorite region. I don’t even have a favorite wine! As soon as a wine sparkles my curiosity, or makes me think a little bit it becomes a favorite. I think the good thing right now is that a lot of tradition is meeting with a lot of innovation, and as a general rule, things are getting simpler. There are a lot of wine regions that aren’t really famous that are now coming out with amazing stuff at good prices, which is also important for wine. For example, some parts of Sicily, like Etna especially. It’s for me, right now, one of the best regions in Italy. I love talking to people who know more about wine and food than me, so learning! And the idea that wine and food are going back to an idea of simplicity and good stuff. Is it just about the taste or is the philosophy also important to you? It’s not just about the taste. The philosophy is sometimes more important, for me at least – knowing the context of something. 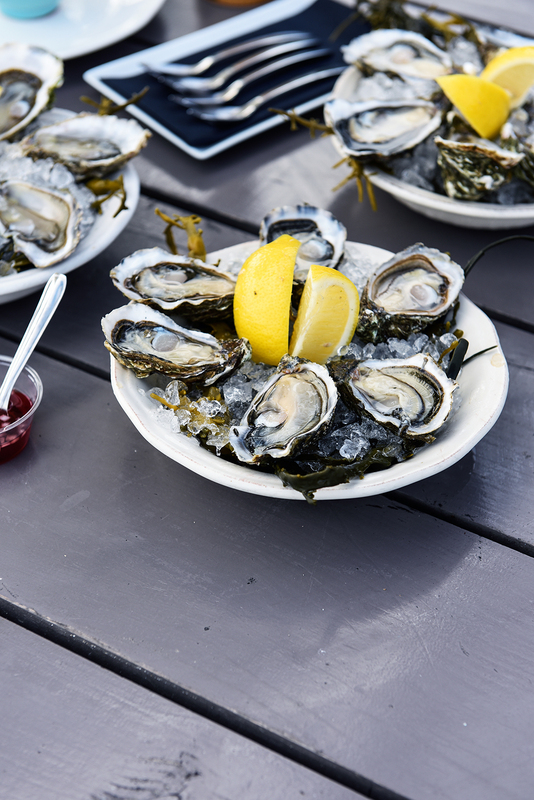 If you consider wine like food, you cannot just concentrate on the taste. It’s like saying, this tomato is delicious but we had to chop down bushes, etc. to make it. The philosophy behind it is important, the idea of the produce is very important. I think what makes the difference between a good wine and a bad wine is actually what’s behind it. I mean, it’s almost strange for me to isolate the taste. Sometimes something can taste very good, but it’s kind of soulless. If there’s an idea behind it, it almost sounds very romantic, but it’s almost like you can actually taste the idea behind the wine. So sometimes the idea is more important than the actual taste… if you can talk about an objective taste! Emiko, can you please tell us about the pasta with broccoli please, it’s such asweet story… the famous pasta! (Laughing) Pasta with broccoli was a very improvised dish, but it was the first thing that I cooked for Marco when we were very early on in our dating phase, very early on. I really didn’t have anything in my fridge! At the time, I was living in this tiny, tiny apartment – the fridge was basically a mini-bar so to begin with I never had much in there anyway. Marco happened to be over and he happened to mention that he was hungry and I said, “Well, do you like broccoli?” and he said, “yes” which I found out later is…. And did you like it, Marco? (Emiko, laughing) He said, “I’m going to marry you!” when he took a bite of it. If you could choose one person to cook a meal for you, who and what would it be, Emiko? It would maybe be my grandmother, my mother’s mother, who passed away about 10 years ago. I would just ask her to make me a normal dish that she would make on any normal day. Something that I have lots of memories of. When I was eating her food I was a lot younger – I wouldn’t have recorded everything like I do now when I’m eating with somebody, where I mentally note everything about the dish! I would definitely have another one of her dishes. It would definitely be my grandmother and one simple dish that I’ve been trying to make as well as she used to but it never works out really. It’s the simplest thing. 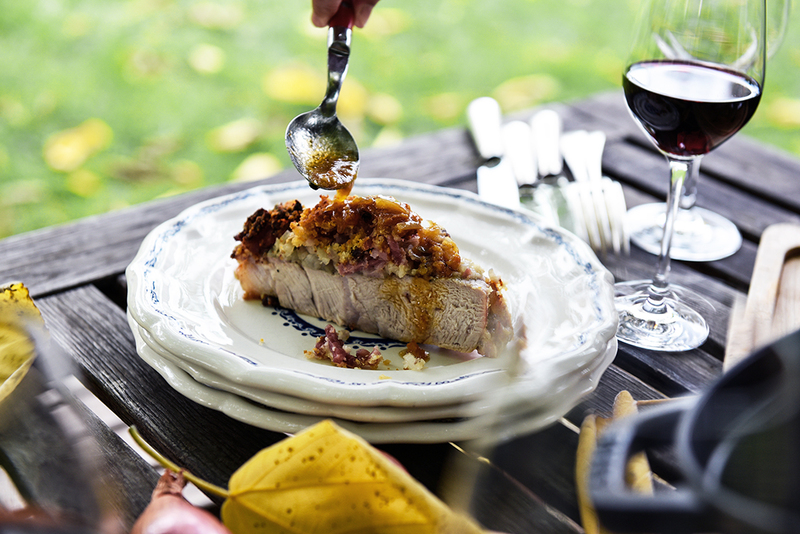 A piece of meat, crumbed with Parmesan, cooked in butter and white wine. For some reason, it just doesn’t come out as nice. And the best part is actually not the meat itself because it’s just a piece of meat, but it’s the sauce that you could probably finish off a whole loaf of bread in it. Thank you, Emiko and Marco! Fine gravel crackled and crunched under my feet, I felt a little dizzy, still overwhelmed by the beauty that I had just witnessed as I drove through the Médoc. If this region were a minimalist painting you’d see a block of green at the bottom and bright blue with white brush strokes at the top, divided by a gentle curve, the horizon. The vines grow in hard parallel lines, covering valleys and hills, and in between you see the most beautiful châteaux, majestic and elegant, the sturdy walls built of bright sandstone reflecting the sun. The grapes are plump, their juices seem ready to burst their skins at any moment, protected by large leaves hanging over the fruits like umbrellas. 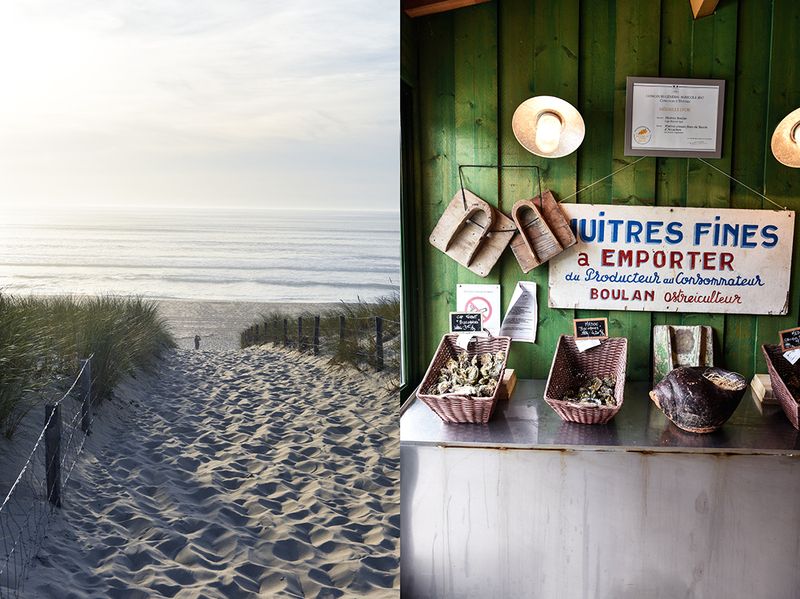 The region is praised for its food and wine, but its landscapes seduces your senses. 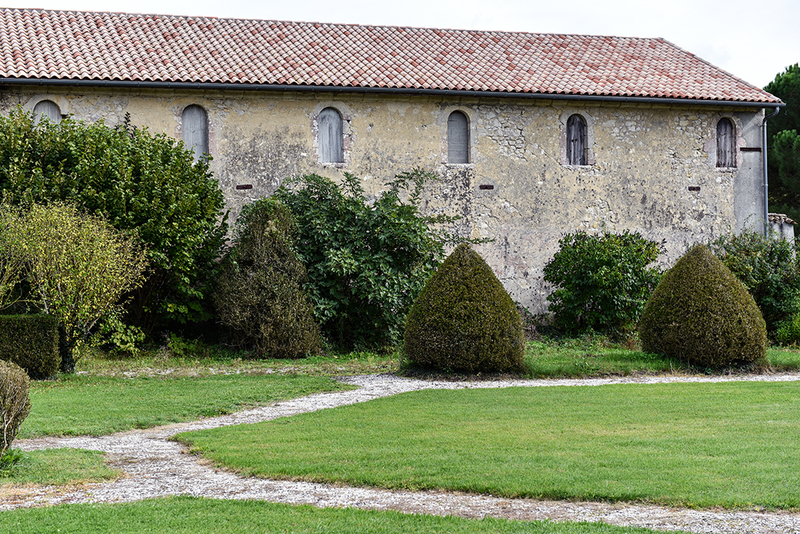 The gravel that I walked on was surrounded by oleander and boxwood shrubs, shaped like pregnant cones. 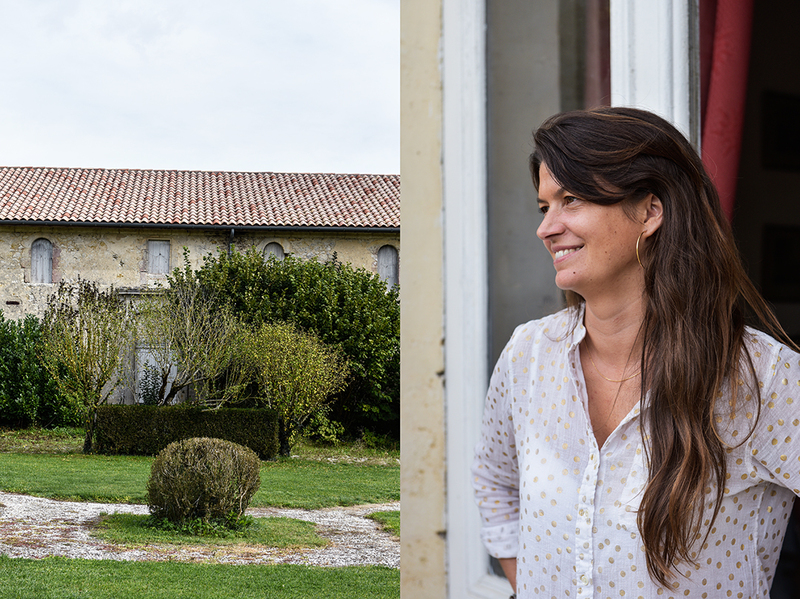 It was a narrow path framing green lawns in geometric patterns, the garden of one of the dreamiest places I’ve seen in my life, the park of the mystic Château Larrivaux – home of the inspiring winemaker Bérangère Tesseron and her family. 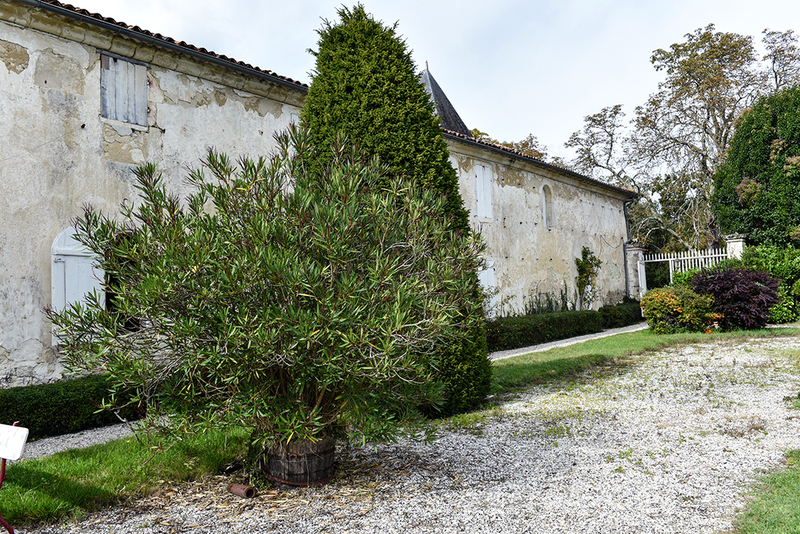 The estate is famous for its outstanding wines, thanks to the women who took care of the land since the château’s cornerstone was laid on the grounds of Cissac-Médoc in 1580. 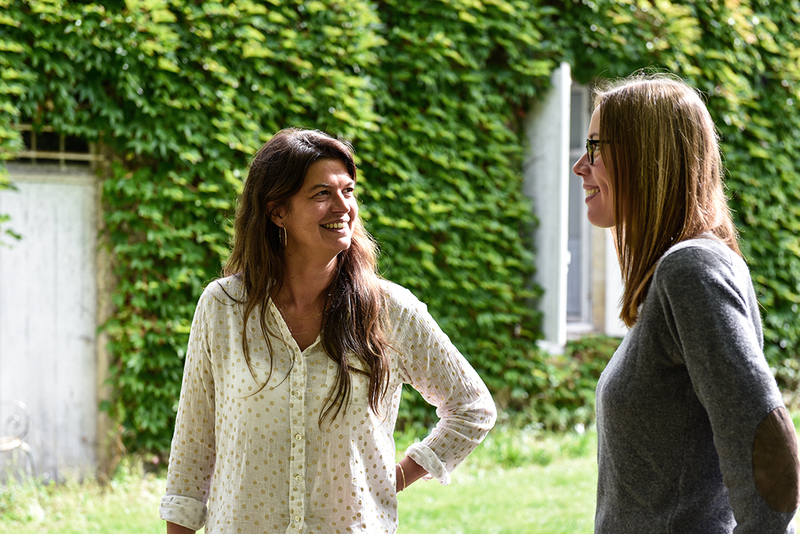 Château Larrivaux was always in the hands of women, strong women, like Bérangère and the generations before her, her mother, aunts, and grandmother. 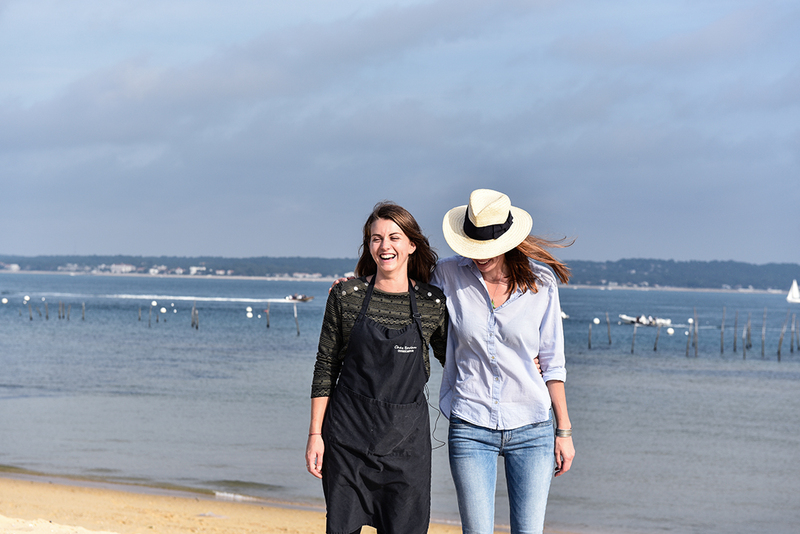 They are passionate women, they love the family and traditions, and they taught Bérangère the sense of these values. They taught her to create something special at Larrivaux to pass it on to her own sons one day. “I’m just a little person, Larrivaux exists for five centuries, I’m here to take Larrivaux and give it to the next generation. You have to be passionate to work at the château, without passion you can’t work here.” There’s just one problem, the winemaker has four sons. Her brother has a daughter, so the future will show if it will be female or male. 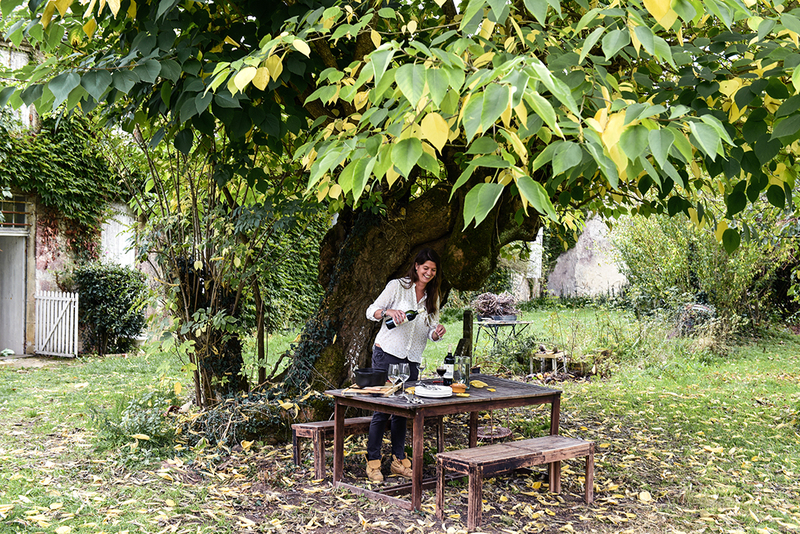 Bérangère’s life can easily seem perfect, like a picture book ideal, but it’s tough, making wine is hard work. She learned to love the weather forecast, she has five apps on her phone. “We always think about wine, looking at the sky, thinking if it will affect the wine, that is stressful, but that’s a part of the game.” Due to the frost in April 2017, she only produced half the amount of bottles that usually fill the estate’s wine cellar. 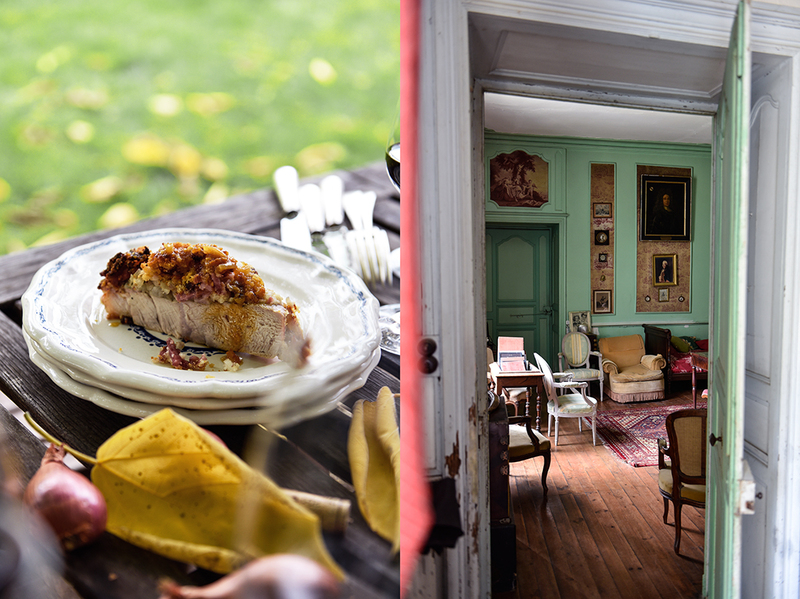 The family loves food and finds relaxation in their charming countryside kitchen inside the château’s thick old walls. 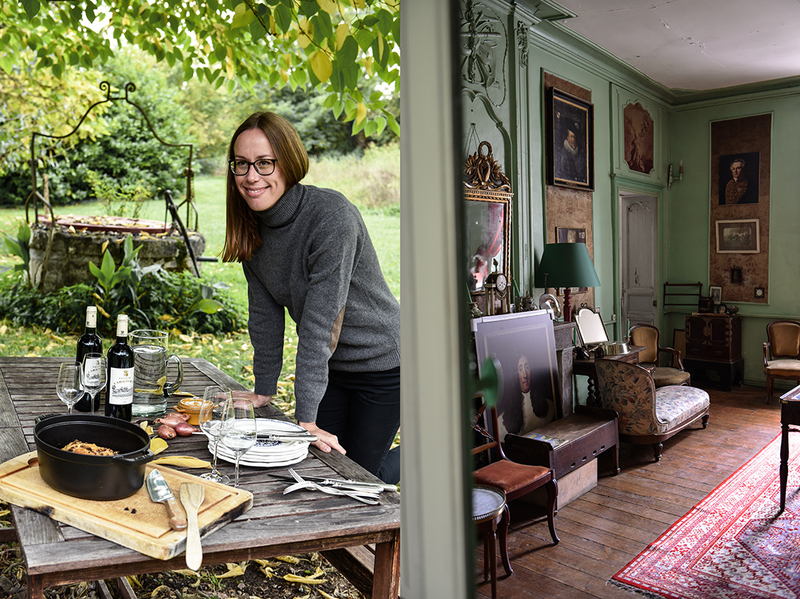 The worn kitchen table has been there since Bérangère laid her hands on it as a child. When she chops the vegetables from her garden, she has a beautiful view of the peaceful park. Everything in this room has a story to tell, every polished copper pot, every detail seems to have found its place through the twists and turns of life, not through a plan. 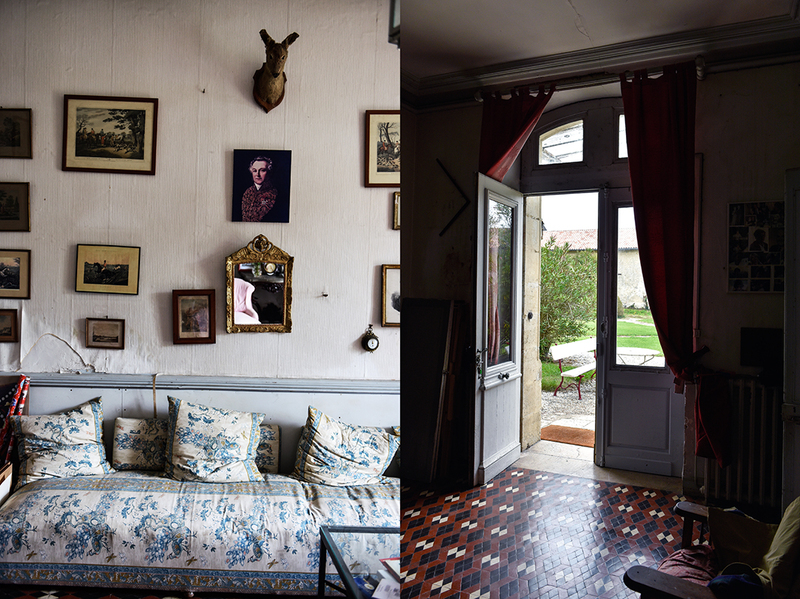 The château is a labyrinth of long corridors with creaking floors and more rooms than one can count, full of antiques, velvet covered chairs, old paintings and drawings, wooden toys, and a deer head watching the scenes in the green painted living room for centuries. It’s a fairy tale turned into a house. 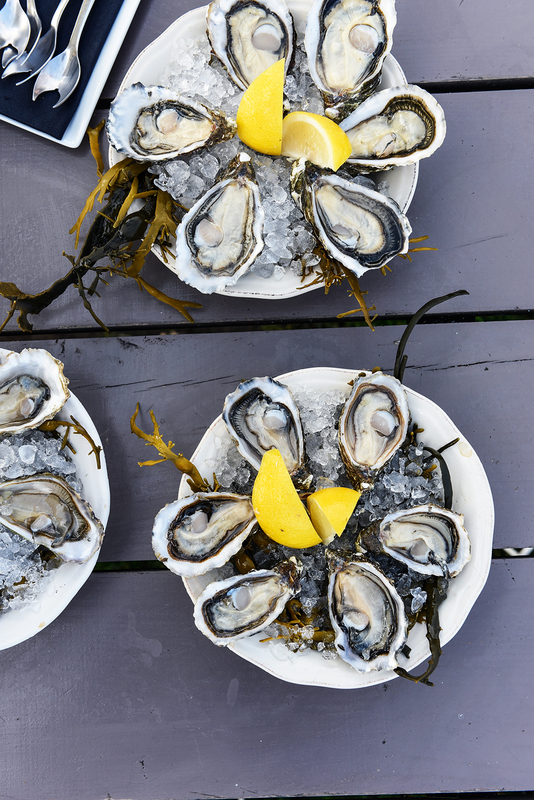 The Tesserons love the French cuisine for celebrating the simple things, fresh fruits and vegetables, good meat and seafood. “When you have your plate in front of you, you know what you’re going to taste, and when you have it in your mouth, you recognize all the different flavors.” The kitchen plays an important role in their life, the kids who are 9, 7, 4, and 1 year old, love cooking with their maman, cleaning mushrooms or forming meatballs. They also bake chocolate cake on their own, “I never touch anything, but I watch them,” says the trustful mother. 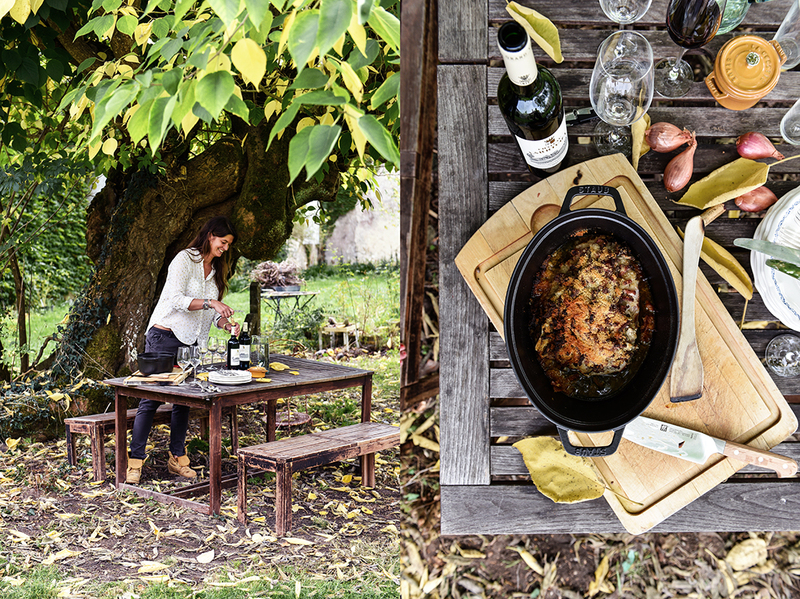 And when she makes her famous Sunday classic, the family’s recipe for Quasi de Veau de Larrivaux (tender veal roast with crunchy bacon topping), the family gathers happily under the ancient tree in the garden, enjoying food, wine, and life. Preheat the oven to 180°C / 350°F. Place the veal in a casserole or baking dish, just large enough to fit the meat. Spread the shallots on top of the roast and cover with the bacon. Squeeze the lemon over the meat, then sprinkle with the breadcrumbs. Season with pepper to taste and roast for 50 minutes. Add a splash of water and continue roasting for about 10 minutes or until the meat is tender. Let the meat sit, covered, for about 10 minutes before serving. 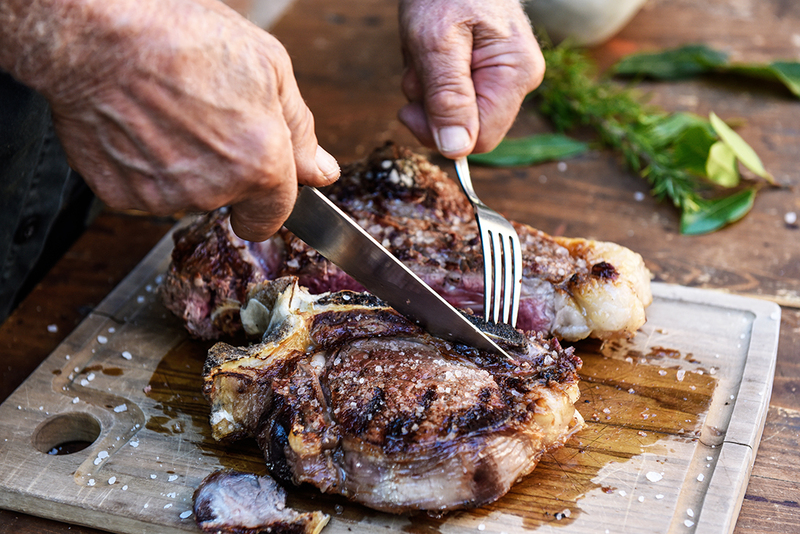 Cut the meat into thick slices, depending on the bacon’s saltiness season with a little salt, and enjoy with a glass of red wine. 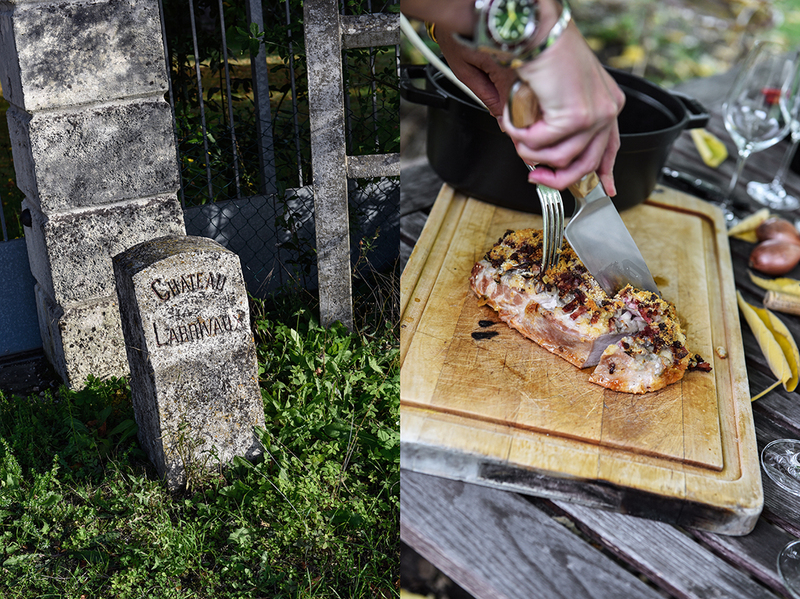 Can you tell us a little more about the story behind Chateau Larrivaux? 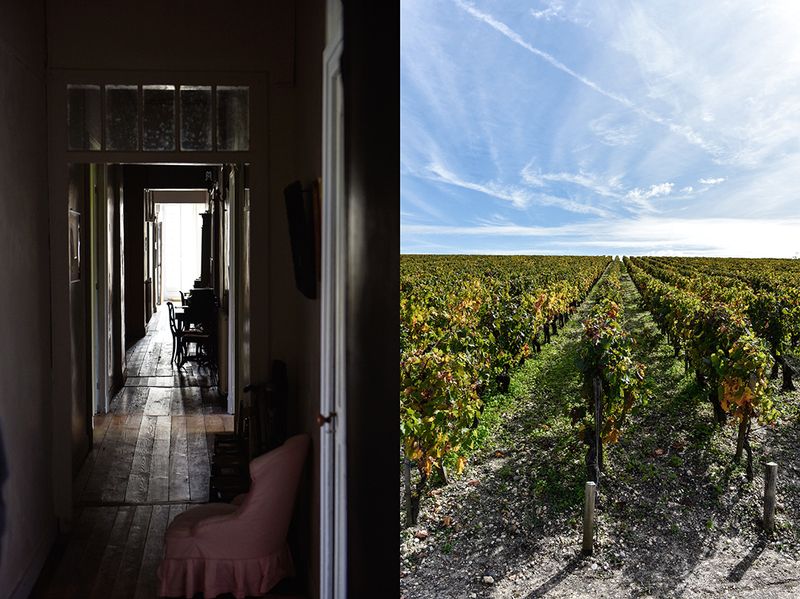 We found out that we have produced wine since 1850, so it’s one of the oldest properties in the Médoc. And it is unusual that it is run only by women. And I have four boys! So you have a problem! I have a problem! But I have a brother who has a little girl, so maybe it will be the little girl. Was there always active wine production here at the estate? Yes, it never stopped but a long time ago there was not only wine. 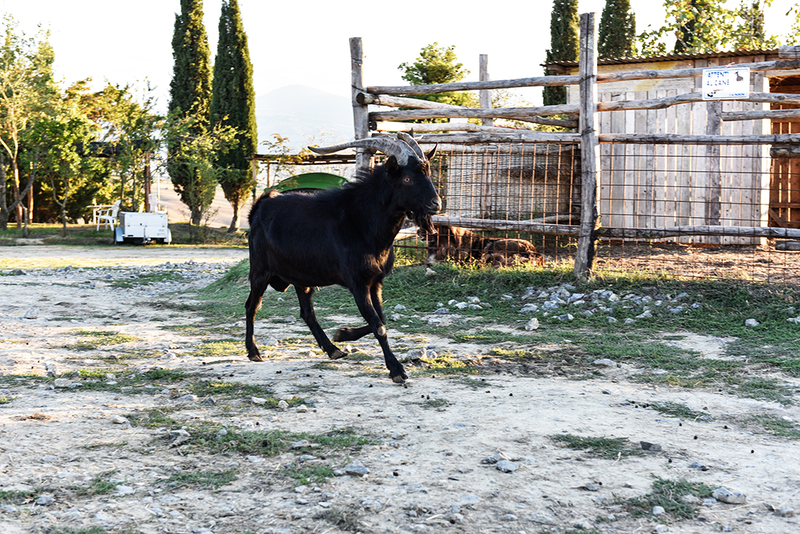 We had a lot of cows and it is a really big property, so we had different activities. But wine has been produced since the beginning. For us it is a family tradition. When I was young, on Sundays for lunch, we kids would have a brugnon (nectarine) – peaches with some wine and some sugar, and a little bit of water. To introduce the children to the tradition of wine drinking! It’s totally separate. I have my property, he has his property. But it’s a family story. We work together because my husband and I, we have the same problems when we make wine, so we exchange a lot, but it’s totally separate. Do you ever keep secrets, if you have a really, really good wine, do you keep it from him? (Laughing) We don’t have the same terroir so we don’t have the same wine. Making wine is really a feeling, and we don’t have the same feeling. I have more Merlot at Larrivaux, and he has more Cabernet at Lafon Rochet. So the wine is totally different – you can’t do the same thing at Larrivaux and Lafon Rochet. Do you see each other as competitors? Do you talk a lot about the weather, about the harvest? Yes, every day. I love the weather forecast! It’s awful for me now because I have three or five apps on the iPhone for the weather forecast: “Oh my god, tomorrow it’s going to rain 2mm! Oh no, it’s going to rain 5mm!” We are always thinking about wine and everywhere we are, we are looking at the sky to see if maybe it will influence the vines. Yes, but it’s normal when you work in agriculture. You’re always stressed by the weather. It’s a part of the game. Have you ever considered producing organic wine? For me, it’s really important to produce wine without or with little pesticides. Because I have four sons, and we live and spend a lot of time at Larrivaux I think it’s important for my kids to be able to come and run in the vineyard and not to be sick after. But for me, organic wine is not the real issue. It’s a step, it’s a good step but it’s not the final issue. The final issue is not to put any pesticides. When you make organic wine, you add cuivre (copper) or bouillie bordelaise (Bordeaux mixture) which is a product you can use in organic wine but it’s not good for the earth. So for me, producing organically is a good step but it’s not the final issue. So it’s not important for you to get the certificate, the organic certificate, but you also use methods that are used in organic wine production. Yes, at Larrivaux we prefer not to use a lot of added substances. Sometimes, if you have to use 1 liter of a certain product, we decide to only use half a liter. We accept that we’re going to have some disease in the vine but it’s not a problem. We’re not going to have lovely vines but it doesn’t matter. We want to make a good product but without a lot of bad substances to protect it. How old were you when you knew you wanted to continue the tradition, when you also wanted to become a winemaker yourself? When I was young I wanted to be a doctor. So not wine! I studied law at university for four years. In my fifth year, I decided to go into wine law. 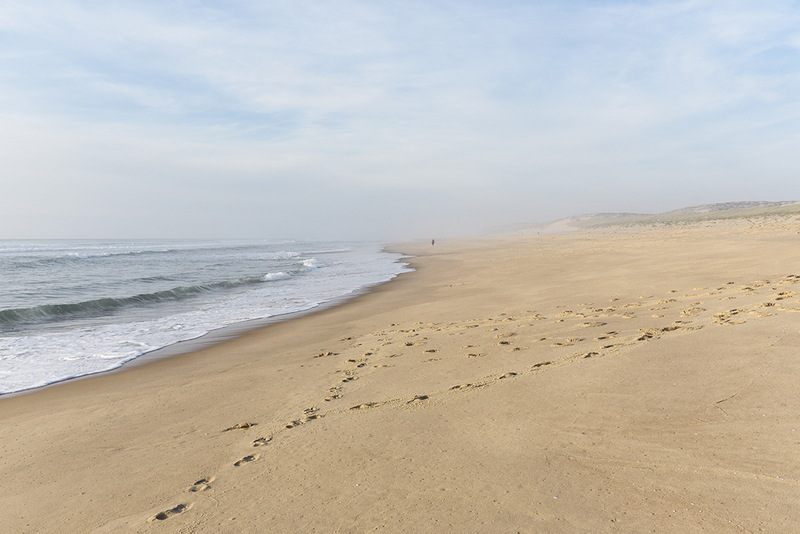 My aunt was working at Larrivaux but only on the weekends – it was not her principal job. Basile and I got married at Larrivaux in 2005. We went on honeymoon and when I came back, my aunt had a problem and she couldn’t work anymore. I said ok, I’m studying wine, and I want to work in the wine industry but maybe not at Larrivaux. But Larrivaux needed someone, so I decided to stay for a few months… and I never left! Yes. It’s really a passion. 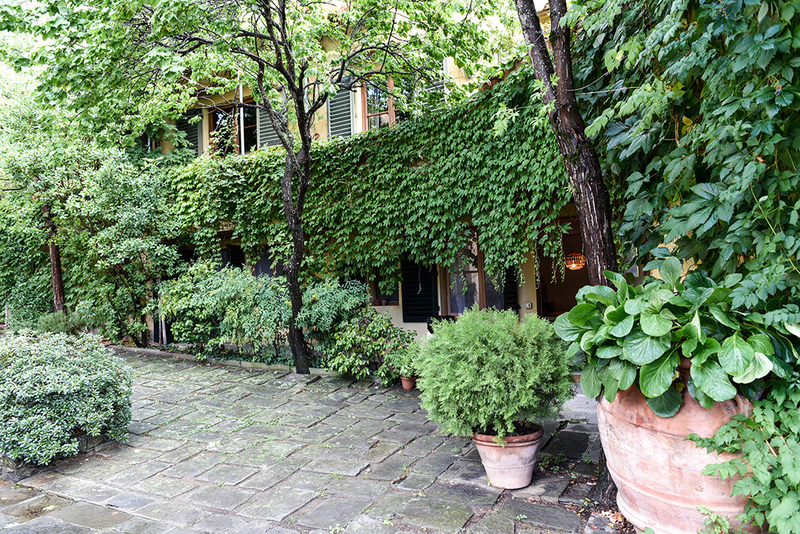 When you work on this kind of property, a small property and everything is old, you can’t sell your wine very expensively. It’s not an expensive wine, so it’s very difficult. So you have to be passionate! How many bottles do you produce a year? 60,000. It depends on the year. This past harvest, we only produced half of what our production normally is because of the frost in April. Where can people buy your wine? Do you sell it online on your website? Not on our website, but I work together with some websites, so you can find it online without any problem. …give it to the next generation. And what if the next generation is a boy? Is that ok for you if there isn’t a girl? I only want for my kids to be happy. If I only have one kid, or no kid who loves wine, it doesn’t matter. At Larrivaux, you have to be passionate to work at Larrivaux. If they are not passionate, they can’t work here. So, we’ll see! 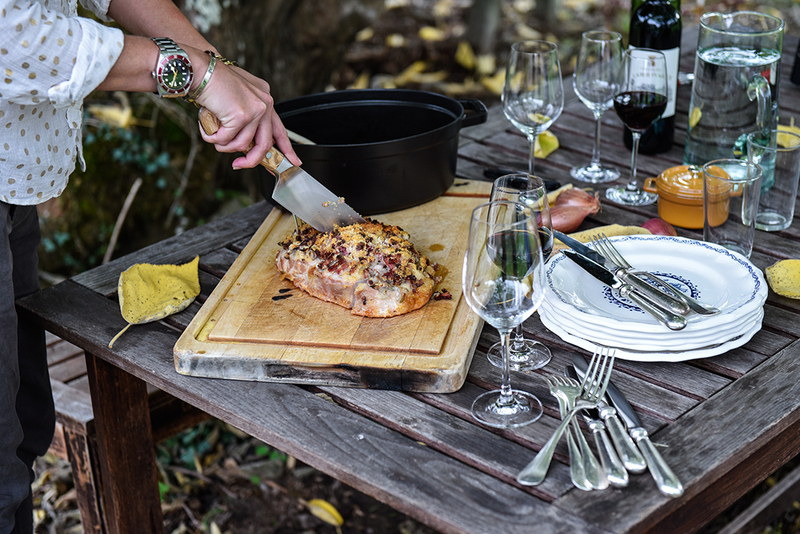 What makes the Chateau Larrivaux wine special? It’s a wine that’s full-bodied with a lot of fruit. Because we have a lot of Merlot, it’s a round and sweet wine. For me, when I drink wine from Larrivaux, I want to eat something. Which is perfect for me because I love to eat (laughing)! For me, it’s a wine you want to share and to finish the bottle. 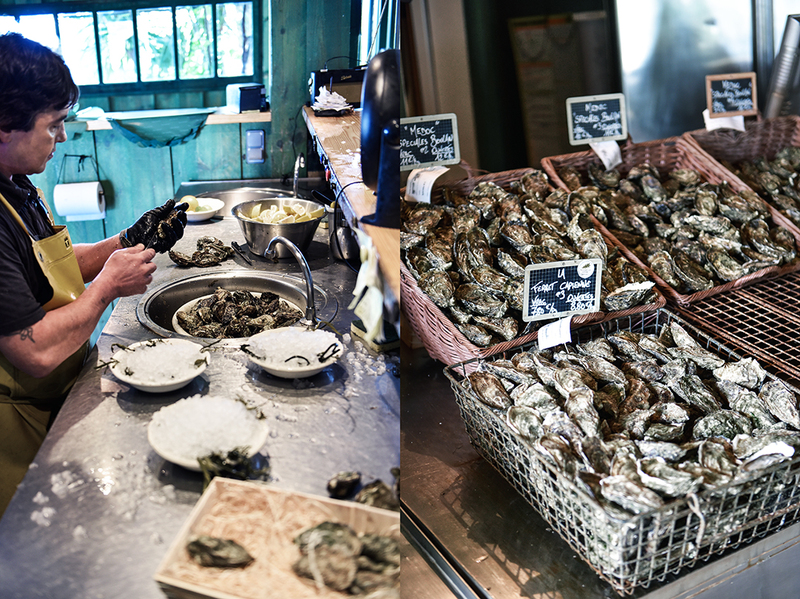 What is the essence of French cuisine for you? For me, it’s simple things: good vegetables, good fruits. You don’t have to add a lot of things. 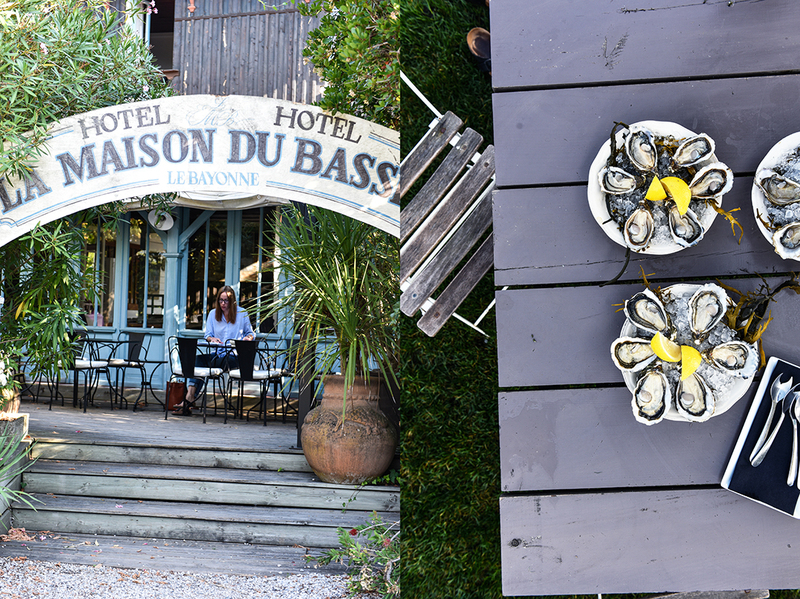 For me, French cuisine is when you have a plate in front of you and you know what you are going to taste. And when you have it in your mouth, you recognize the different tastes of the things you have on your plate. Do you produce your own fruits and vegetables here at Chateau Larrivaux? Not all of them, but I do have some vegetables, yes. And it’s not organic – I don’t put anything! No, it’s more than organic! 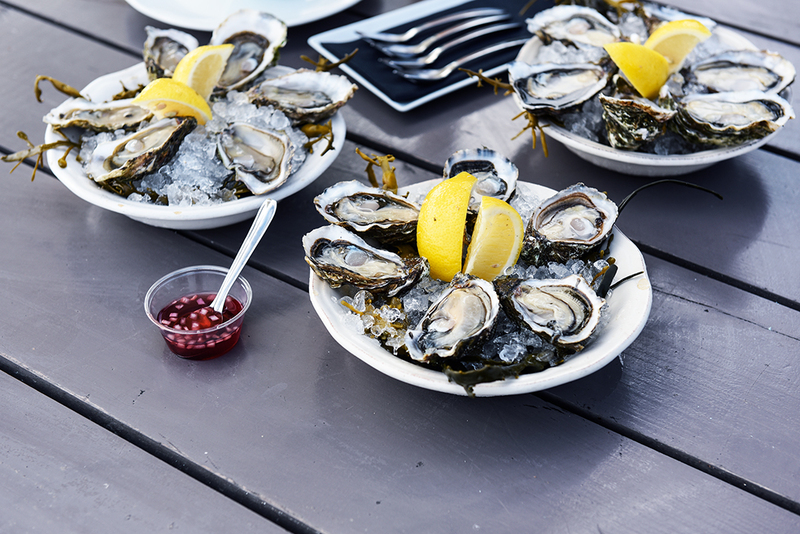 Did food always play an important role in your family? Wine was always there, but the food? Did you always cook with the family? Yes, yes, yes. I always saw my grandmother cooking, my aunt and my mother too. I always saw people working in the kitchen. 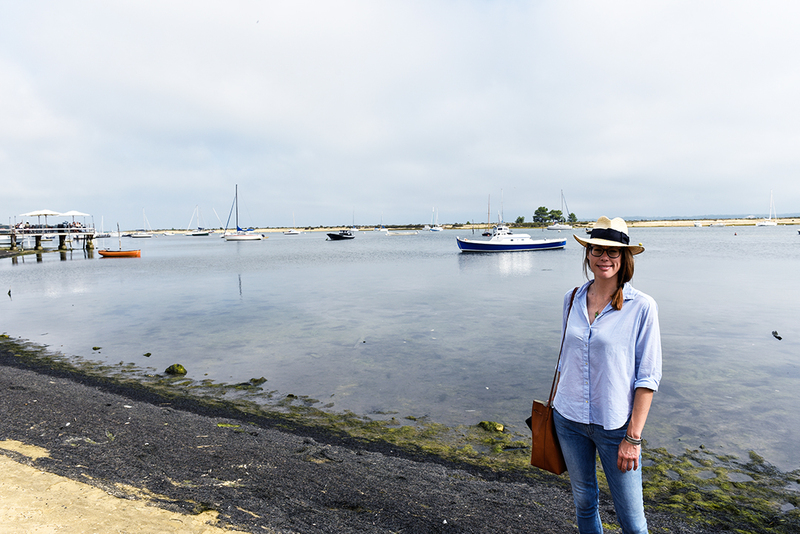 What do you love about the Médoc? 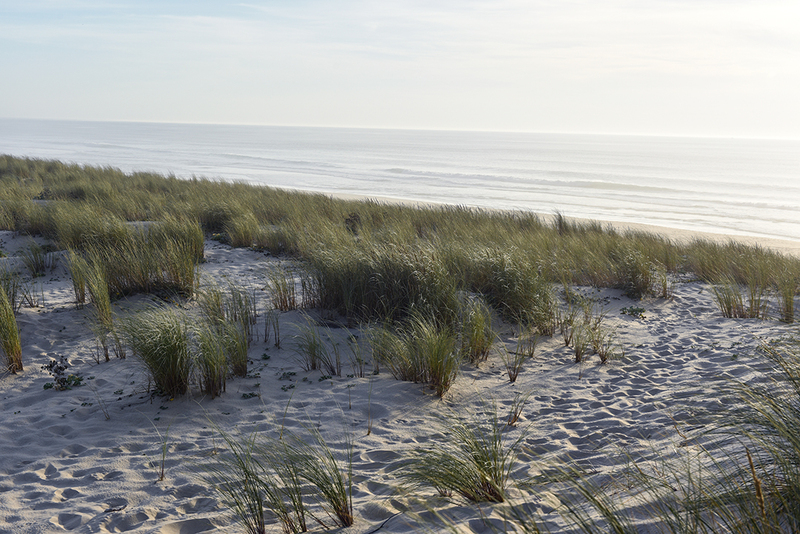 The place itself because there are a lot of places in the Médoc. 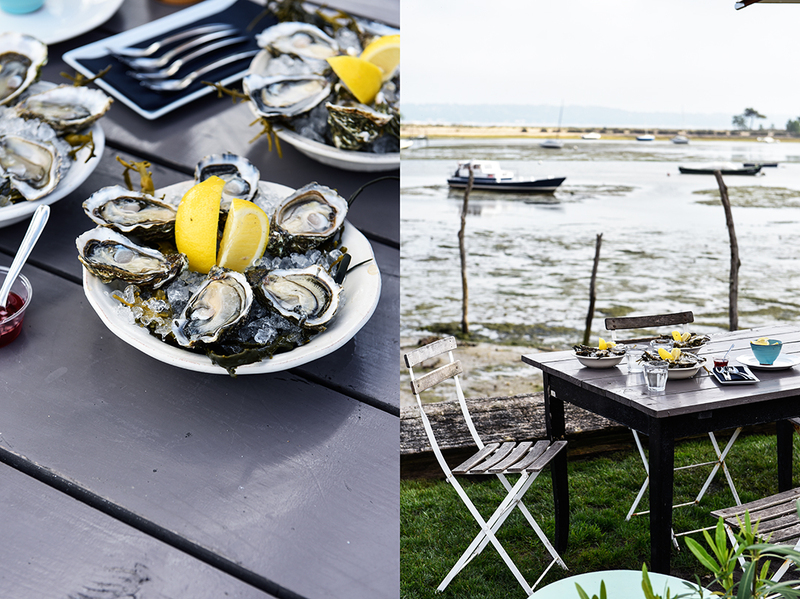 You have the vineyards, but you also have the seaside. 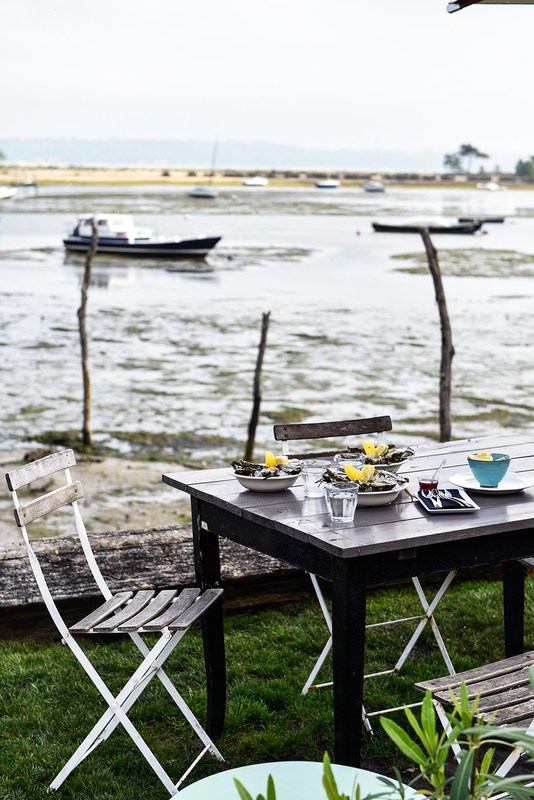 You have the countryside, but it’s only one hour from Bordeaux. 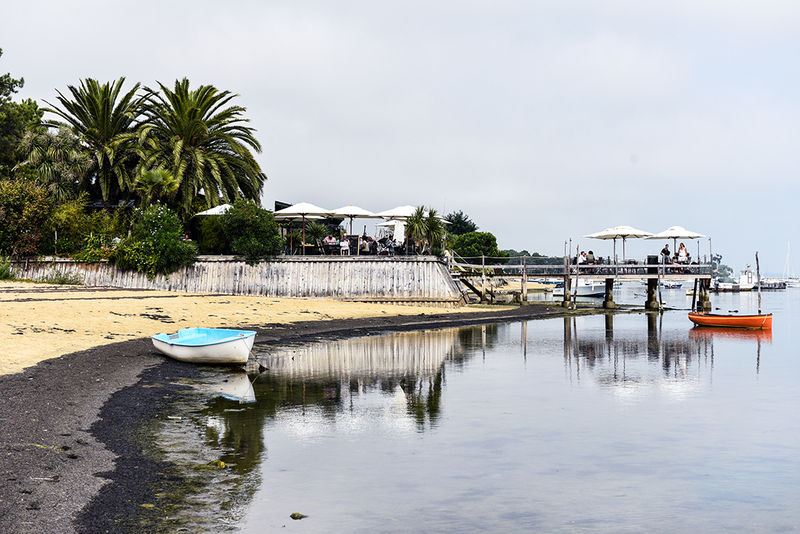 There are a lot of things to do in the Médoc, but it’s a secret spot for the moment. So it’s great. It’s good for us. 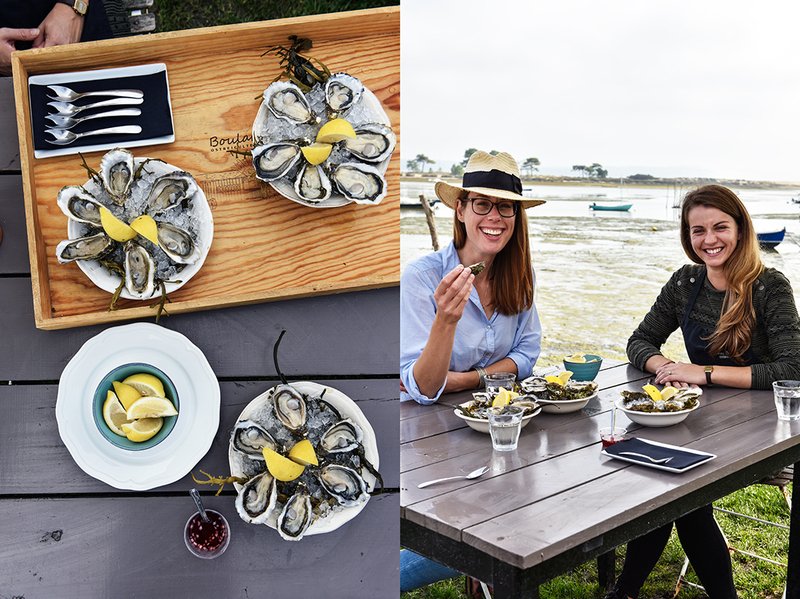 You have a lot of things to do in the Médoc – there’s not only the wine. If you could choose one person to cook a meal for you, who would this person be and what would this person cook for you? I can only choose one person? Ok, two! You can choose two. Two? Ok. Alors… only two? Ok three! Starter, main, and dessert! Ok, my grandmother because she makes a huge sort of gougère – it’s a little choux with some cheese. And she makes a big gougère with béchamel and it was delicious! She’s the only person who made this like that. Then, I choose my husband, because for my birthday he sometimes makes paris-brest and I love the paris-brest! I think it’s difficult to have a good paris-brest. So every year I ask him to make one for me. And one more person for the dessert? Maybe my mother, to make some profiteroles – some choux with some vanilla cream inside and some caramel on the top. Like a pièce montée. Here at Larrivaux, not every Sunday, but often, we have some choux with caramel. 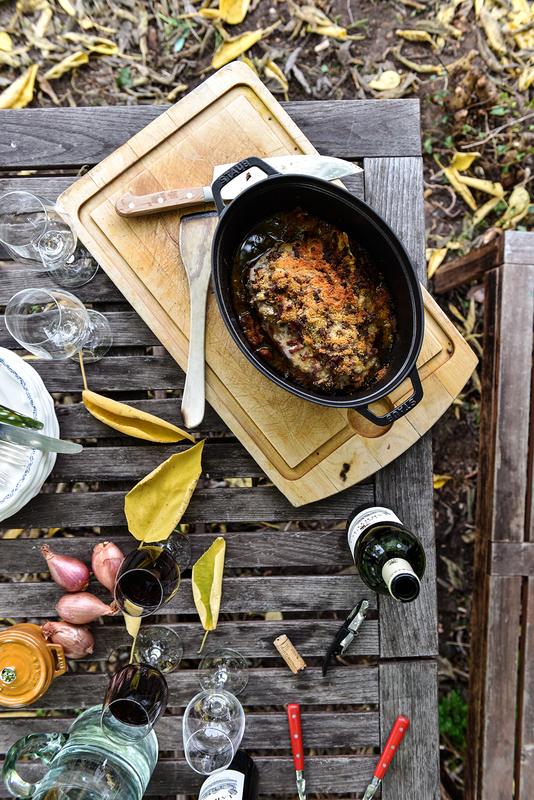 Do you prefer to cook on your own or with other people? It depends on the recipe. For family recipes, I prefer to be with my family: my children, my husband, my mother. For recipes I find in a book, I think it’s really important to share them with someone. Everyone has their fashion, they own way of doing things – I think it’s important to learn and to share. Do you prefer improvised meals or planned meals? Did you ever cook a meal that was so disastrous that you said I’m never going to cook that again? Macarons! I’ve never made good macarons! But I want to learn. There is a dessert in Bordeaux – a strawberry macaron – inside you have whipped cream with vanilla and fresh strawberries. It’s very good!